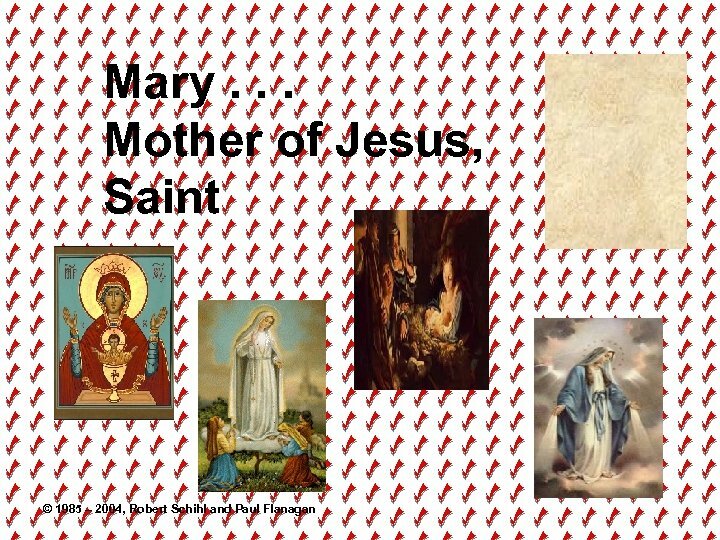 Mary: An Introduction The teachings of Catholic Christianity about the role of Mary, the Mother of Jesus, are some of the most misunderstood and exaggerated beliefs dividing the Body of Christ. 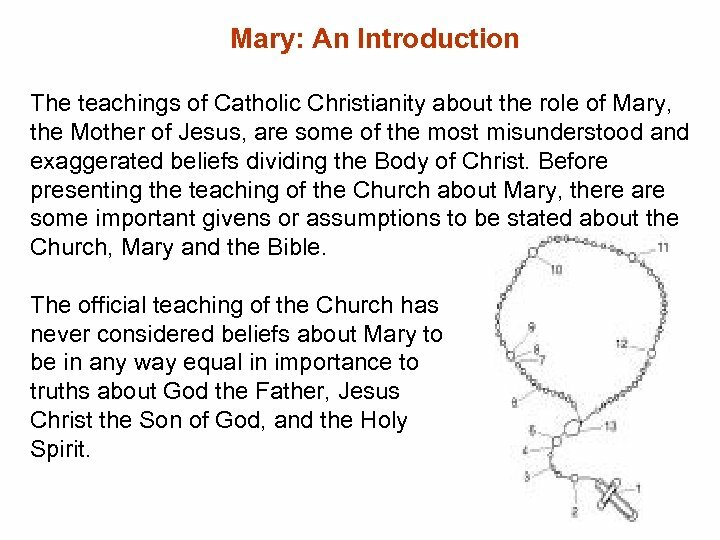 Before presenting the teaching of the Church about Mary, there are some important givens or assumptions to be stated about the Church, Mary and the Bible. The official teaching of the Church has never considered beliefs about Mary to be in any way equal in importance to truths about God the Father, Jesus Christ the Son of God, and the Holy Spirit. 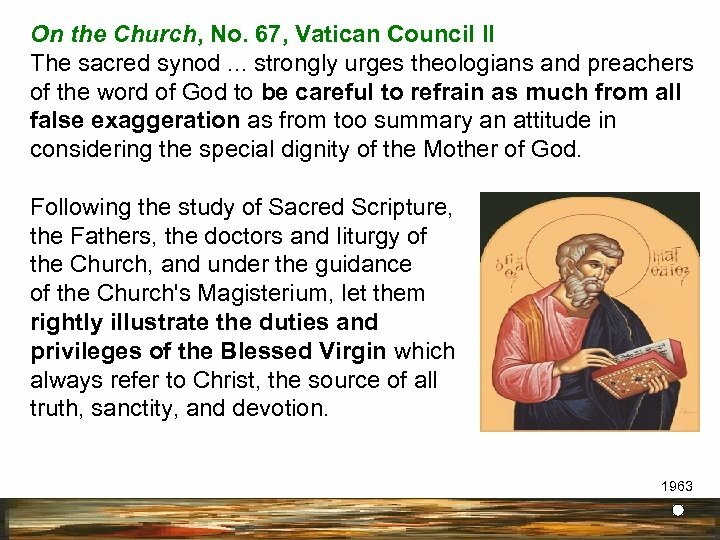 Vatican Council II expressed it best when the Council Fathers wrote: On Ecumenism, No. 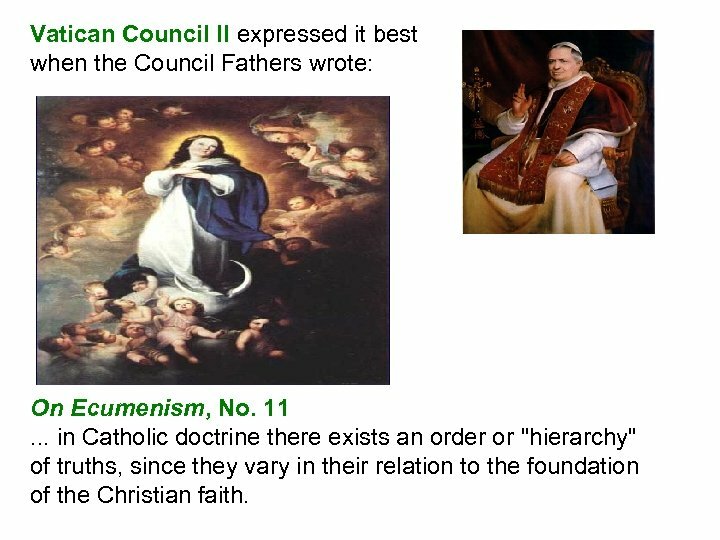 11. . . in Catholic doctrine there exists an order or "hierarchy" of truths, since they vary in their relation to the foundation of the Christian faith. The truths about Mary are important because they are still truth, since they are based in the Bible. But they are not central to the primary gospel message of our salvation through Jesus Christ. 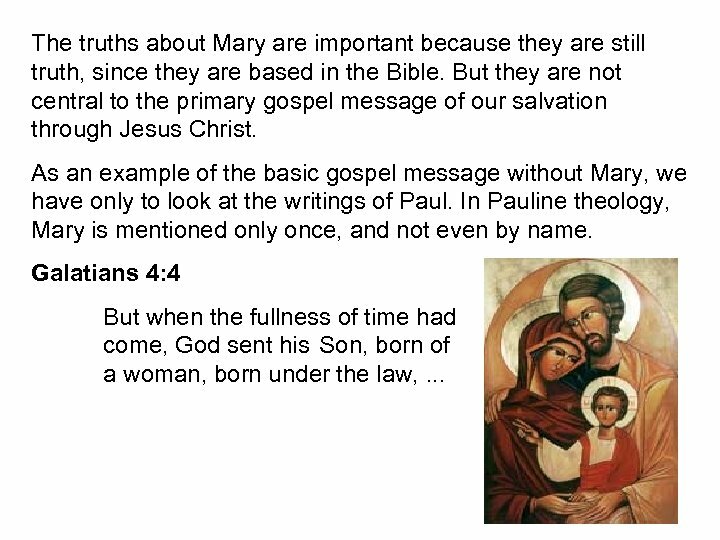 As an example of the basic gospel message without Mary, we have only to look at the writings of Paul. 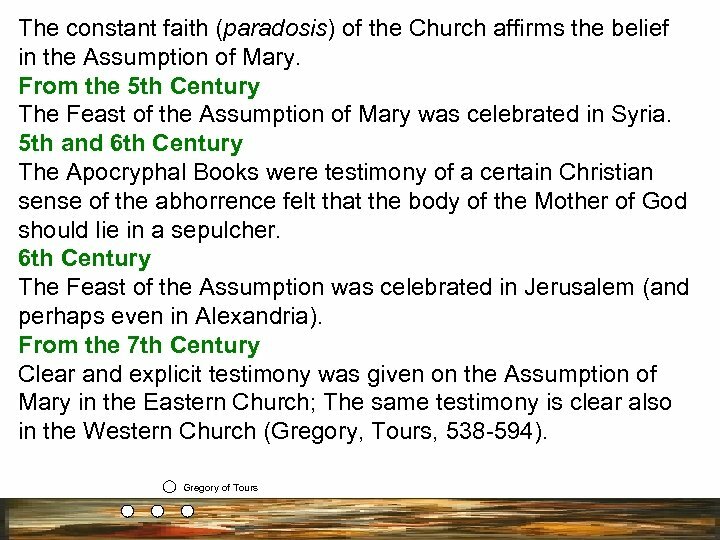 In Pauline theology, Mary is mentioned only once, and not even by name. Galatians 4: 4 But when the fullness of time had come, God sent his Son, born of a woman, born under the law, . 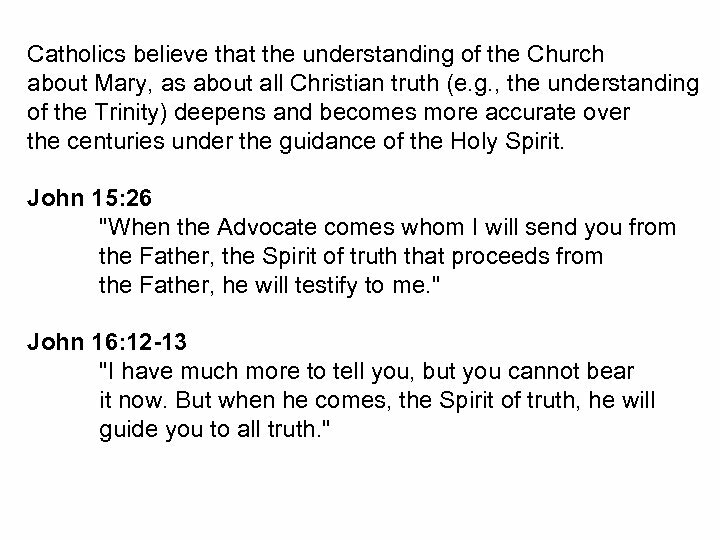 . .
Catholics believe that the understanding of the Church about Mary, as about all Christian truth (e. g. , the understanding of the Trinity) deepens and becomes more accurate over the centuries under the guidance of the Holy Spirit. John 15: 26 "When the Advocate comes whom I will send you from the Father, the Spirit of truth that proceeds from the Father, he will testify to me. " John 16: 12 -13 "I have much more to tell you, but you cannot bear it now. But when he comes, the Spirit of truth, he will guide you to all truth. " 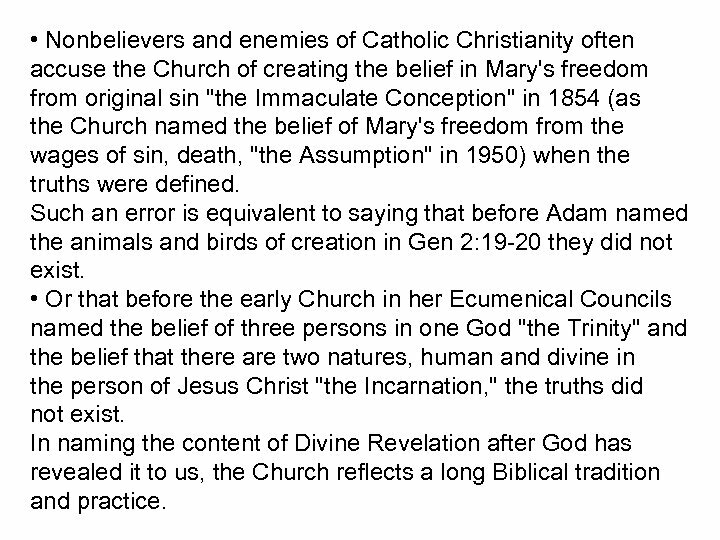 When the Catholic Church appears to teach "new doctrines" about Mary, it is often a statement of truth against some current errors or a clarification of truths that have always been taught and believed by Christians through the centuries. 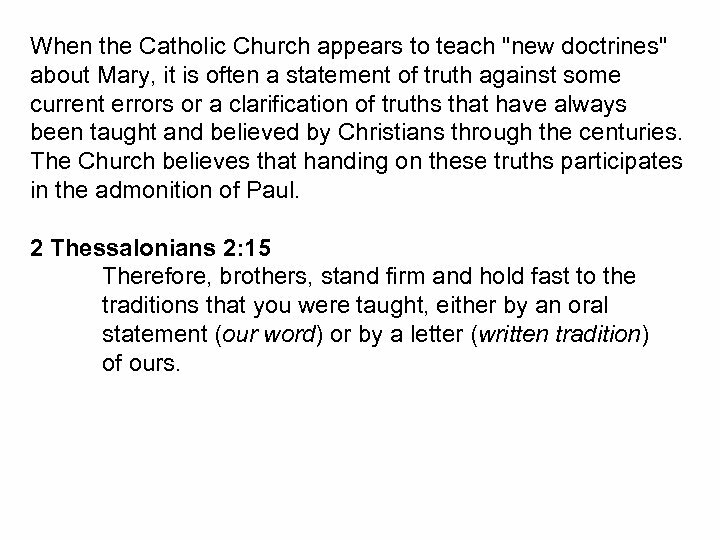 The Church believes that handing on these truths participates in the admonition of Paul. 2 Thessalonians 2: 15 Therefore, brothers, stand firm and hold fast to the traditions that you were taught, either by an oral statement (our word) or by a letter (written tradition) of ours. 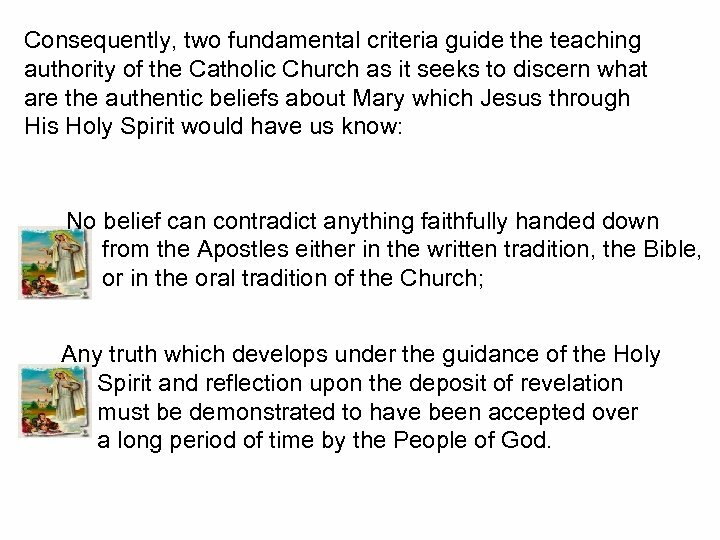 Consequently, two fundamental criteria guide the teaching authority of the Catholic Church as it seeks to discern what are the authentic beliefs about Mary which Jesus through His Holy Spirit would have us know: No belief can contradict anything faithfully handed down from the Apostles either in the written tradition, the Bible, or in the oral tradition of the Church; Any truth which develops under the guidance of the Holy Spirit and reflection upon the deposit of revelation must be demonstrated to have been accepted over a long period of time by the People of God. A Biblical Portrait of Mary is prefigured immediately after the Fall of Man; her divine motherhood is prophesied. Genesis 3: 14 -15 Then the Lord God said to the serpent: ". . . I will put enmity between you and the woman, and between your offspring and hers; He will strike at your head, while you strike at his heel. " Mary and her role in the history of our salvation is foretold by the prophet Isaiah; her virginity and divine motherhood is confirmed. Isaiah 7: 13 Therefore the Lord himself will give you this sign: the virgin shall be with child, and bear a son, and shall name him Immanuel. 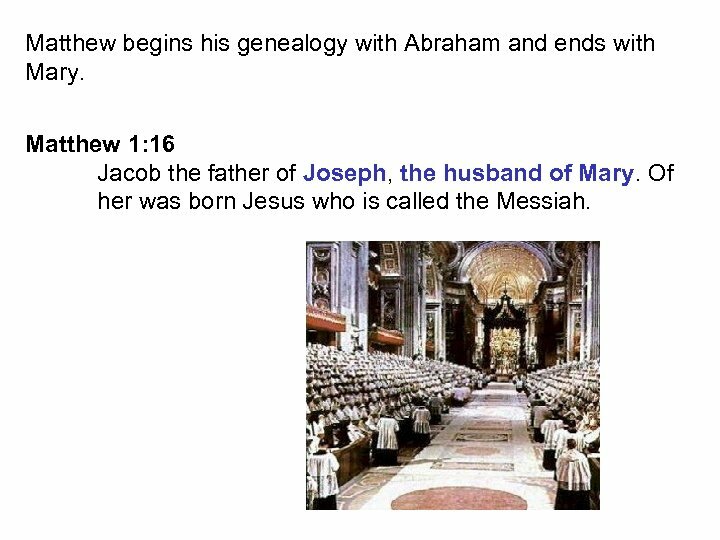 Matthew begins his genealogy with Abraham and ends with Mary. Matthew 1: 16 Jacob the father of Joseph, the husband of Mary. 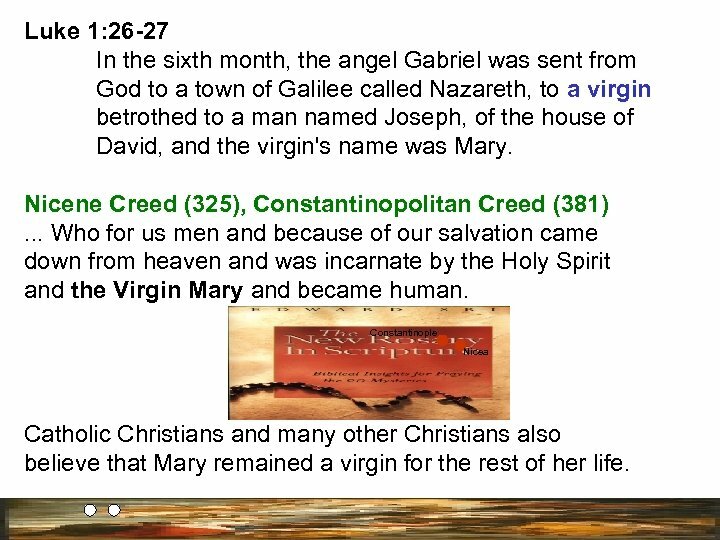 Of her was born Jesus who is called the Messiah. 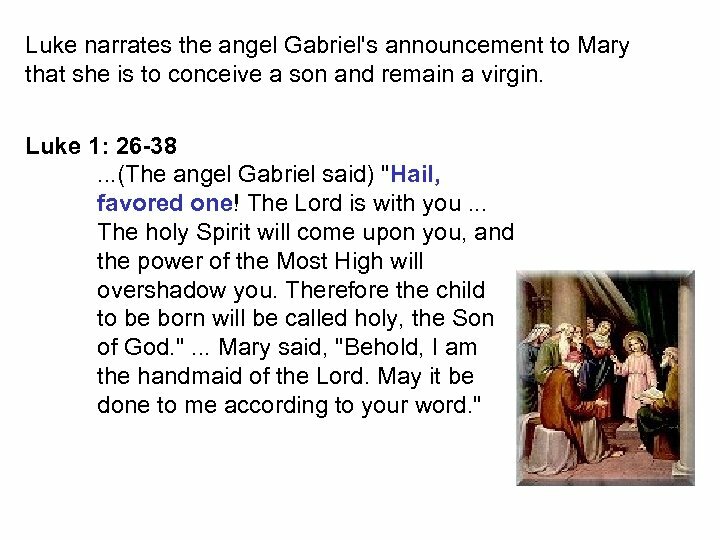 Luke narrates the angel Gabriel's announcement to Mary that she is to conceive a son and remain a virgin. Luke 1: 26 -38. . . (The angel Gabriel said) "Hail, favored one! The Lord is with you. . . The holy Spirit will come upon you, and the power of the Most High will overshadow you. Therefore the child to be born will be called holy, the Son of God. ". . . Mary said, "Behold, I am the handmaid of the Lord. May it be done to me according to your word. " 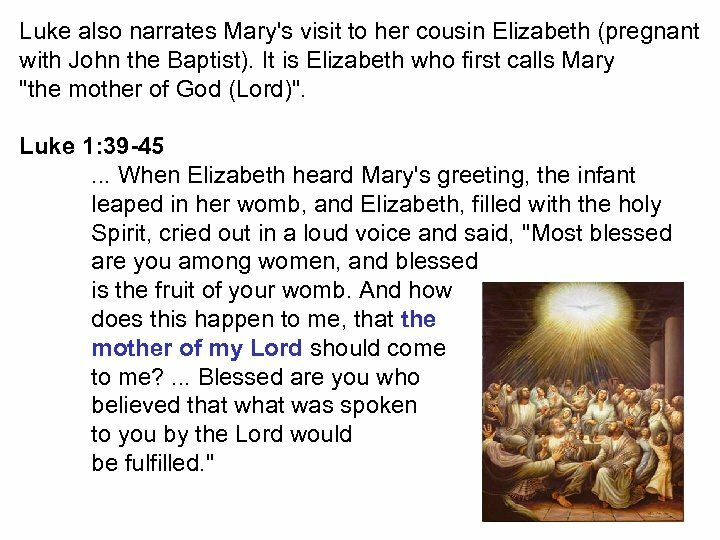 Luke also narrates Mary's visit to her cousin Elizabeth (pregnant with John the Baptist). 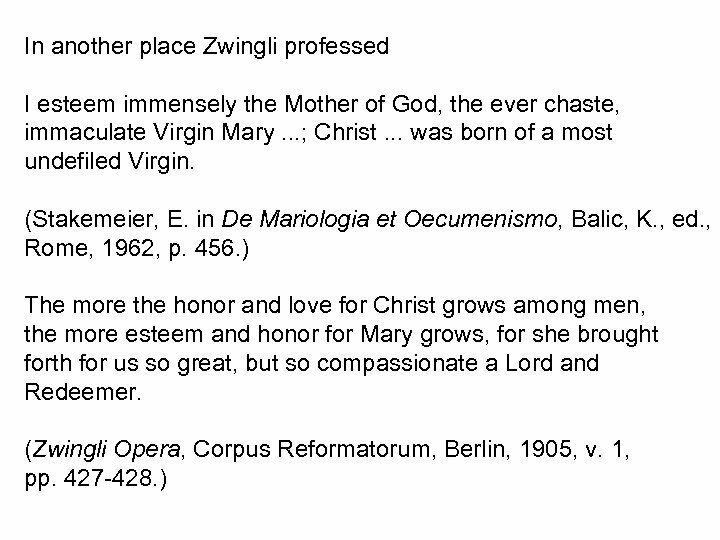 It is Elizabeth who first calls Mary "the mother of God (Lord)". Luke 1: 39 -45. . . When Elizabeth heard Mary's greeting, the infant leaped in her womb, and Elizabeth, filled with the holy Spirit, cried out in a loud voice and said, "Most blessed are you among women, and blessed is the fruit of your womb. And how does this happen to me, that the mother of my Lord should come to me? . . . Blessed are you who believed that was spoken to you by the Lord would be fulfilled. " 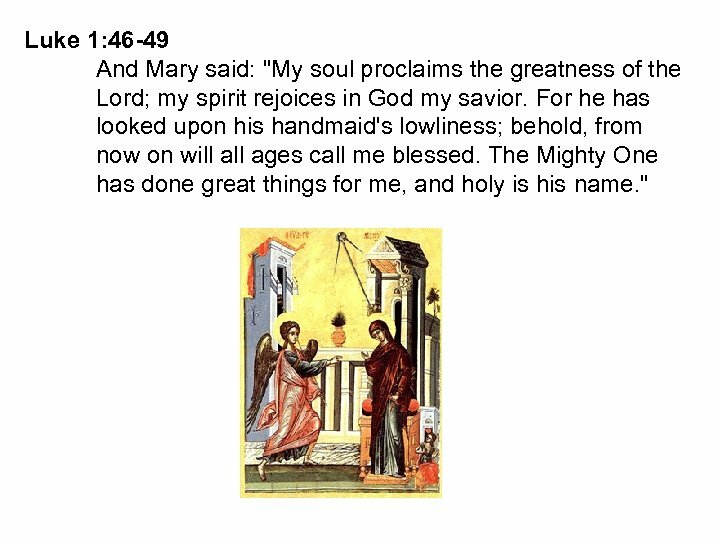 Luke 1: 46 -49 And Mary said: "My soul proclaims the greatness of the Lord; my spirit rejoices in God my savior. For he has looked upon his handmaid's lowliness; behold, from now on will ages call me blessed. The Mighty One has done great things for me, and holy is his name. " 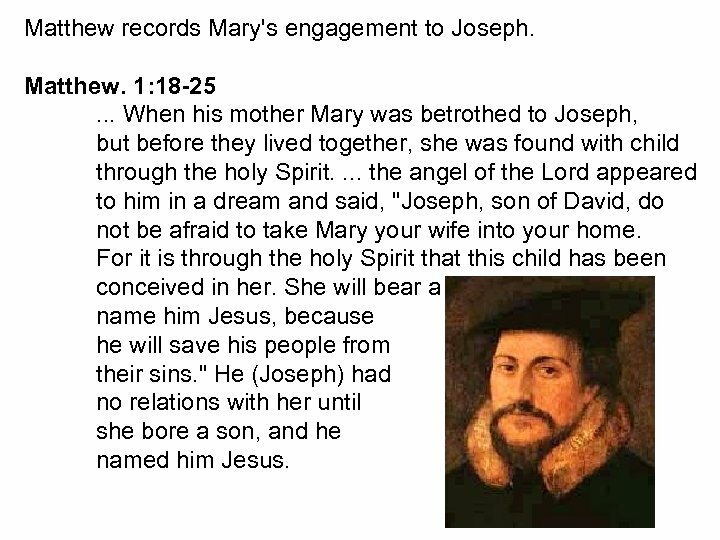 Matthew records Mary's engagement to Joseph. Matthew. 1: 18 -25. . . When his mother Mary was betrothed to Joseph, but before they lived together, she was found with child through the holy Spirit. . the angel of the Lord appeared to him in a dream and said, "Joseph, son of David, do not be afraid to take Mary your wife into your home. For it is through the holy Spirit that this child has been conceived in her. She will bear a son and you are to name him Jesus, because he will save his people from their sins. " He (Joseph) had no relations with her until she bore a son, and he named him Jesus. 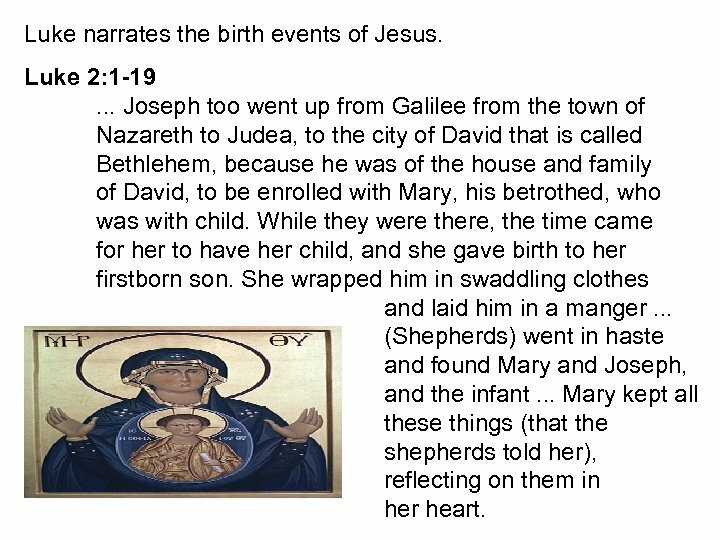 Luke narrates the birth events of Jesus. Luke 2: 1 -19. . . Joseph too went up from Galilee from the town of Nazareth to Judea, to the city of David that is called Bethlehem, because he was of the house and family of David, to be enrolled with Mary, his betrothed, who was with child. While they were there, the time came for her to have her child, and she gave birth to her firstborn son. She wrapped him in swaddling clothes and laid him in a manger. . . (Shepherds) went in haste and found Mary and Joseph, and the infant. . . Mary kept all these things (that the shepherds told her), reflecting on them in her heart. Luke includes the circumcision and presentation of Jesus. 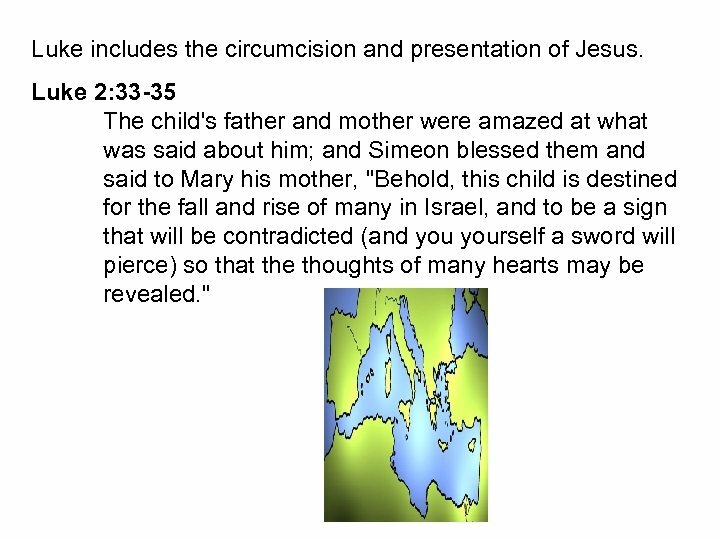 Luke 2: 33 -35 The child's father and mother were amazed at what was said about him; and Simeon blessed them and said to Mary his mother, "Behold, this child is destined for the fall and rise of many in Israel, and to be a sign that will be contradicted (and yourself a sword will pierce) so that the thoughts of many hearts may be revealed. " 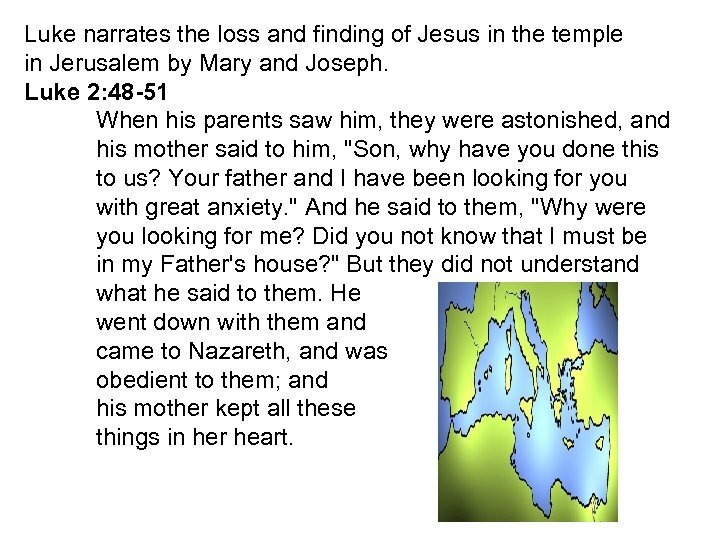 Luke narrates the loss and finding of Jesus in the temple in Jerusalem by Mary and Joseph. Luke 2: 48 -51 When his parents saw him, they were astonished, and his mother said to him, "Son, why have you done this to us? Your father and I have been looking for you with great anxiety. " And he said to them, "Why were you looking for me? Did you not know that I must be in my Father's house? " But they did not understand what he said to them. He went down with them and came to Nazareth, and was obedient to them; and his mother kept all these things in her heart. John records the wedding feast at Cana where Mary prompts Jesus' first miracle. 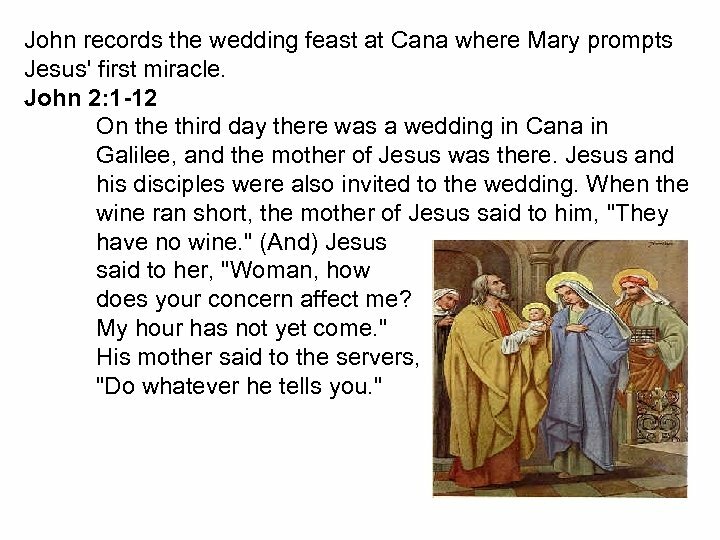 John 2: 1 -12 On the third day there was a wedding in Cana in Galilee, and the mother of Jesus was there. Jesus and his disciples were also invited to the wedding. When the wine ran short, the mother of Jesus said to him, "They have no wine. " (And) Jesus said to her, "Woman, how does your concern affect me? My hour has not yet come. " His mother said to the servers, "Do whatever he tells you. " 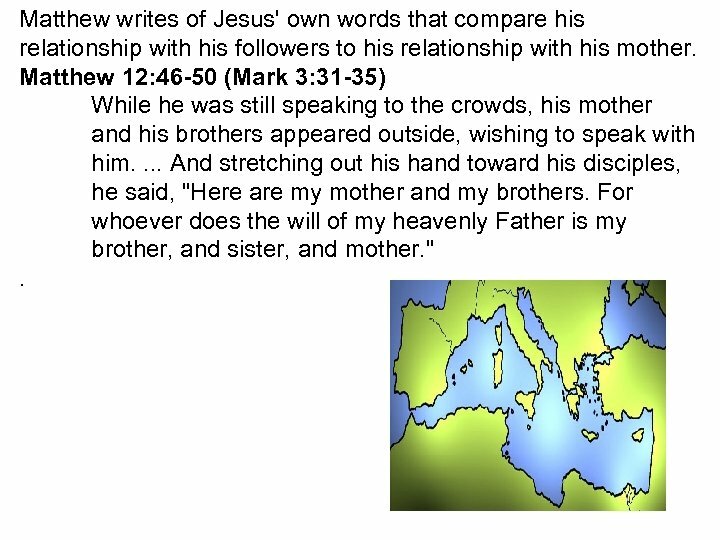 Matthew writes of Jesus' own words that compare his relationship with his followers to his relationship with his mother. 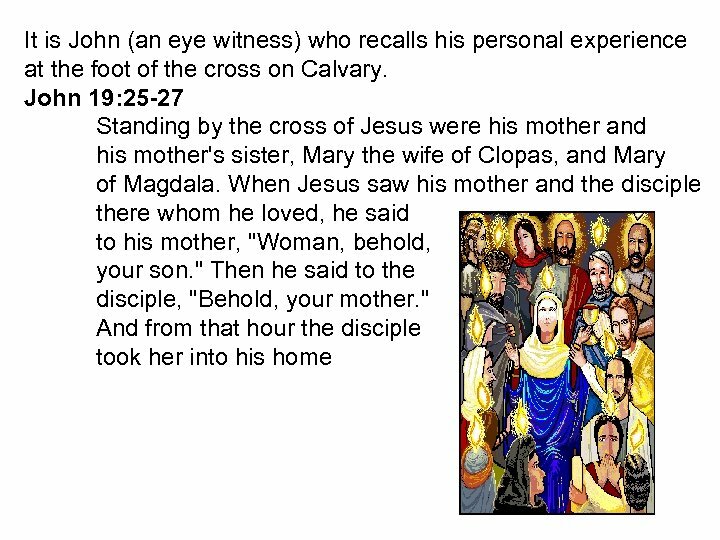 Matthew 12: 46 -50 (Mark 3: 31 -35) While he was still speaking to the crowds, his mother and his brothers appeared outside, wishing to speak with him. . And stretching out his hand toward his disciples, he said, "Here are my mother and my brothers. For whoever does the will of my heavenly Father is my brother, and sister, and mother. " . Luke, in his Acts of the Apostles, records the presence of Mary with the Apostles in the community in Jerusalem between the Ascension of Jesus and Pentecost. 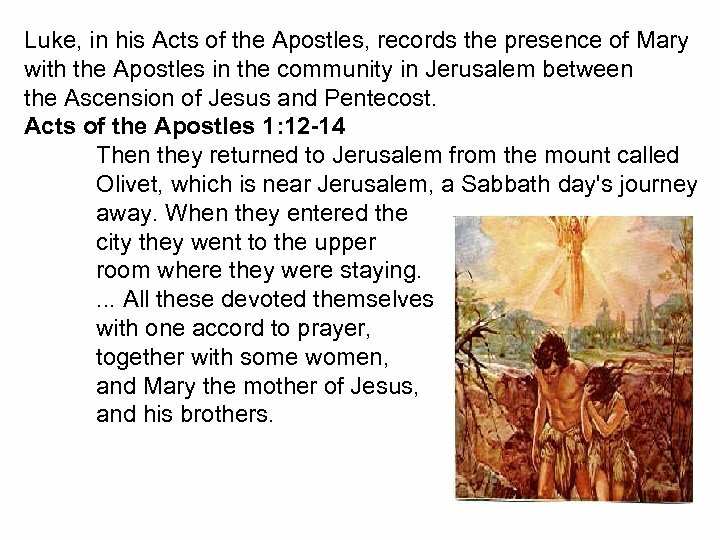 Acts of the Apostles 1: 12 -14 Then they returned to Jerusalem from the mount called Olivet, which is near Jerusalem, a Sabbath day's journey away. When they entered the city they went to the upper room where they were staying. . All these devoted themselves with one accord to prayer, together with some women, and Mary the mother of Jesus, and his brothers. 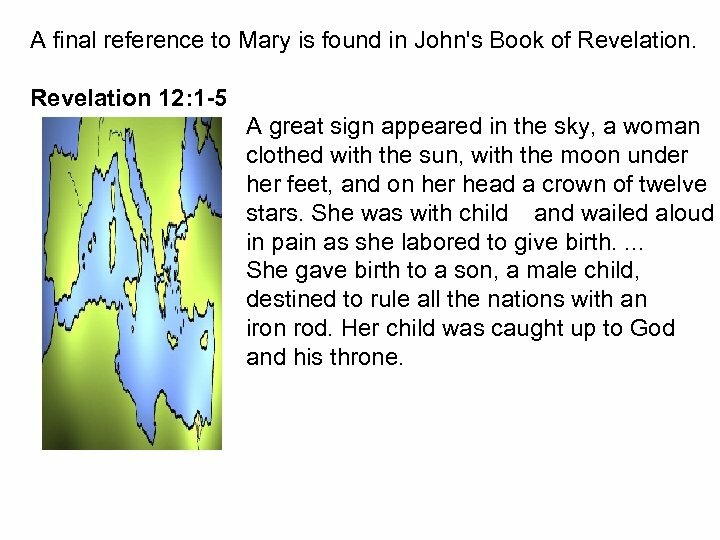 A final reference to Mary is found in John's Book of Revelation 12: 1 -5 A great sign appeared in the sky, a woman clothed with the sun, with the moon under her feet, and on her head a crown of twelve stars. She was with child and wailed aloud in pain as she labored to give birth. . She gave birth to a son, a male child, destined to rule all the nations with an iron rod. Her child was caught up to God and his throne. Mary: Virgin and Ever Virgin All Christians believe that Mary was a virgin before and at the time of the birth of her son Jesus. 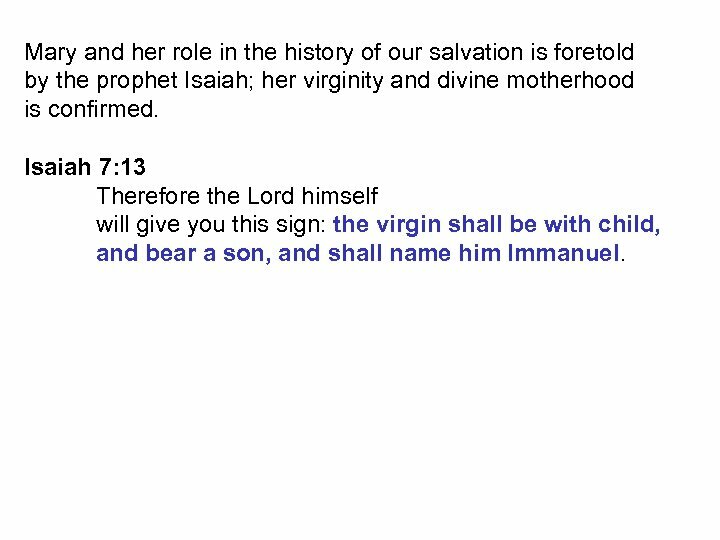 Isaiah 7: 14 The virgin shall be with child, and bear a son, and shall name him Immanuel. Matthew 1: 18 -25 Now this is how the birth of Jesus Christ came about. When his mother Mary was betrothed to Joseph, but before they lived together, she was found with child through the holy Spirit. Joseph her husband, since he was a righteous man, yet unwilling to expose her to shame, decided to divorce her quietly. Such was his intention when, behold, the angel of the Lord appeared to him in a dream and said, "Joseph, son of David, do not be afraid to take Mary your wife into your home. For it is through the holy Spirit that this child has been conceived in her. She will bear a son and you are to name him Jesus, because he will save his people from their sins. " 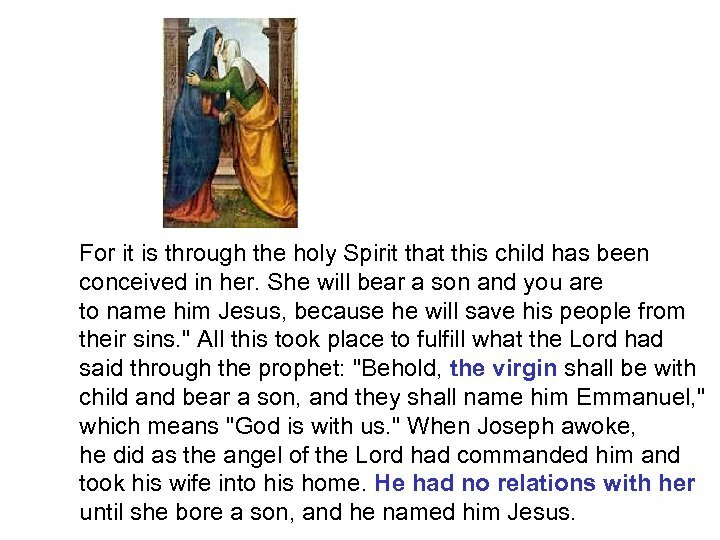 All this took place to fulfill what the Lord had said through the prophet: "Behold, the virgin shall be with child and bear a son, and they shall name him Emmanuel, " which means "God is with us. " When Joseph awoke, he did as the angel of the Lord had commanded him and took his wife into his home. He had no relations with her until she bore a son, and he named him Jesus. Luke 1: 26 -27 In the sixth month, the angel Gabriel was sent from God to a town of Galilee called Nazareth, to a virgin betrothed to a man named Joseph, of the house of David, and the virgin's name was Mary. Nicene Creed (325), Constantinopolitan Creed (381). . . Who for us men and because of our salvation came down from heaven and was incarnate by the Holy Spirit and the Virgin Mary and became human. . . Constantinople Nicea Catholic Christians and many other Christians also believe that Mary remained a virgin for the rest of her life. Constant faith of the Church Great teachers of the Church from at least the fourth century spoke of Mary as having remained a virgin throughout her life: Athanasius (Alexandria, 293 - 373) Epiphanius (Palestine, 315? - 403) Jerome (Stridon, present day Sloenia, 345? - 419) Augustine (Numidia, now Algeria, 354 - 430) Cyril (Alexandria, 376 - 444) and others. 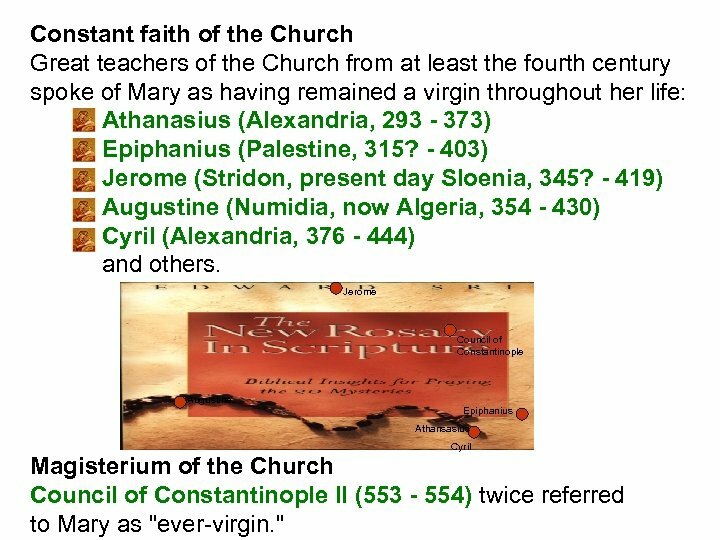 Jerome Council of Constantinople Augustine Epiphanius Athansasius Cyril Magisterium of the Church Council of Constantinople II (553 - 554) twice referred to Mary as "ever-virgin. " 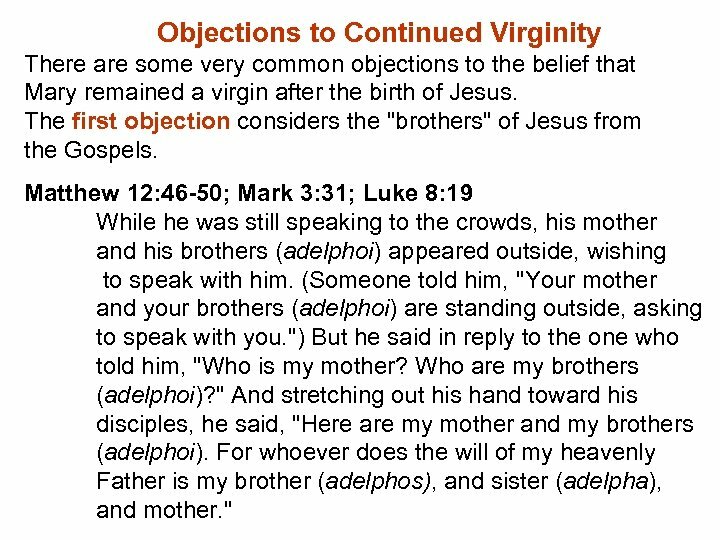 Objections to Continued Virginity There are some very common objections to the belief that Mary remained a virgin after the birth of Jesus. The first objection considers the "brothers" of Jesus from the Gospels. Matthew 12: 46 -50; Mark 3: 31; Luke 8: 19 While he was still speaking to the crowds, his mother and his brothers (adelphoi) appeared outside, wishing to speak with him. (Someone told him, "Your mother and your brothers (adelphoi) are standing outside, asking to speak with you. ") But he said in reply to the one who told him, "Who is my mother? 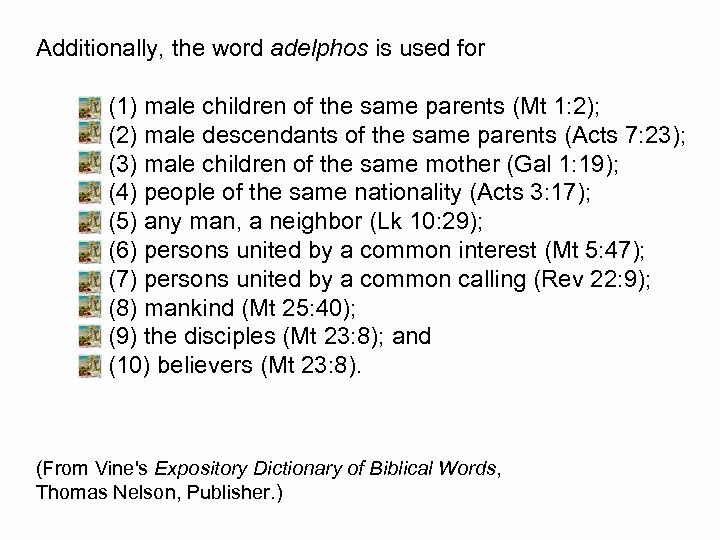 Who are my brothers (adelphoi)? " And stretching out his hand toward his disciples, he said, "Here are my mother and my brothers (adelphoi). For whoever does the will of my heavenly Father is my brother (adelphos), and sister (adelpha), and mother. " Mark 6: 3 Is he not the carpenter, the son of Mary, and the brother (adelphos) of James and Joses and Judas and Simon? And are not his sisters (adelphai) here with us? First it is important to note that the Bible does not say that these "brothers and sisters" of Jesus were children of Mary. 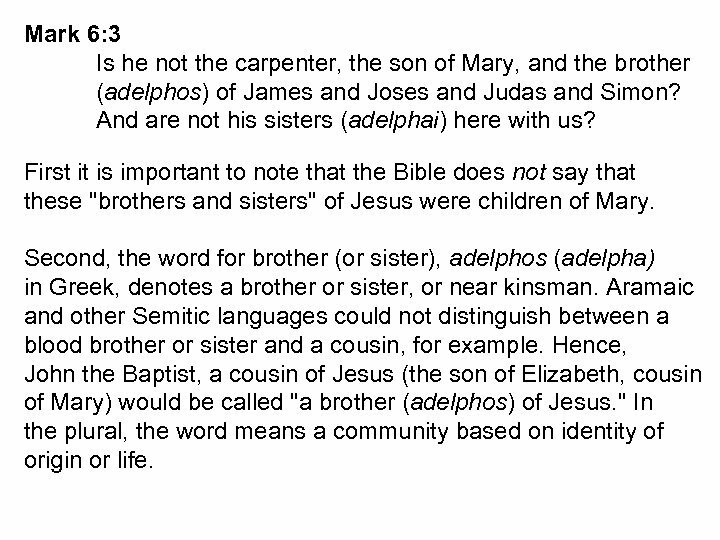 Second, the word for brother (or sister), adelphos (adelpha) in Greek, denotes a brother or sister, or near kinsman. Aramaic and other Semitic languages could not distinguish between a blood brother or sister and a cousin, for example. Hence, John the Baptist, a cousin of Jesus (the son of Elizabeth, cousin of Mary) would be called "a brother (adelphos) of Jesus. " In the plural, the word means a community based on identity of origin or life. 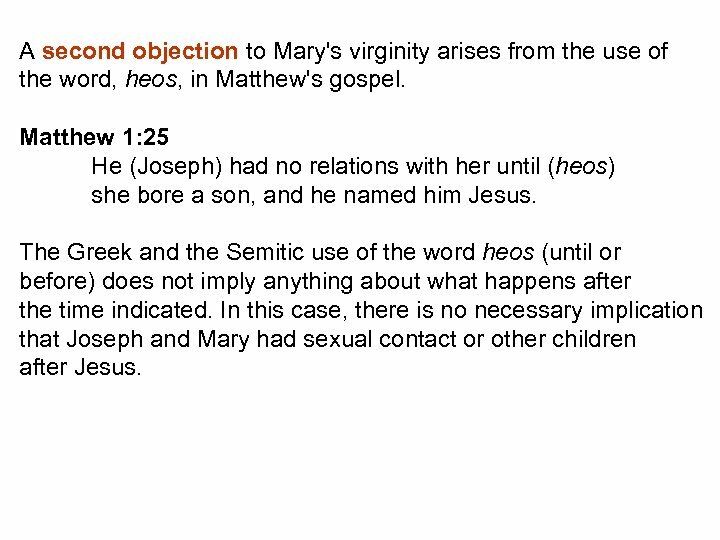 A second objection to Mary's virginity arises from the use of the word, heos, in Matthew's gospel. Matthew 1: 25 He (Joseph) had no relations with her until (heos) she bore a son, and he named him Jesus. The Greek and the Semitic use of the word heos (until or before) does not imply anything about what happens after the time indicated. 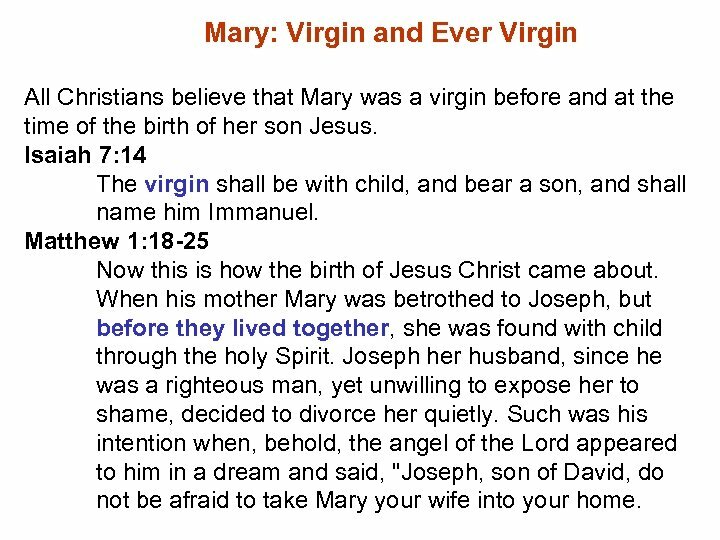 In this case, there is no necessary implication that Joseph and Mary had sexual contact or other children after Jesus. 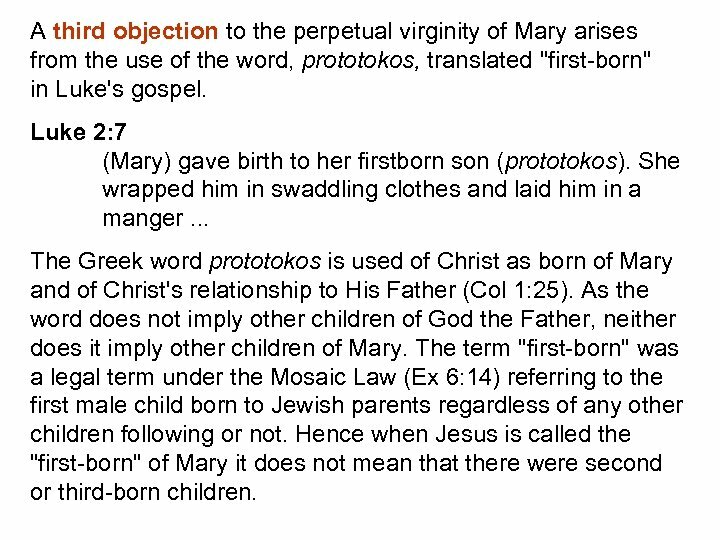 A third objection to the perpetual virginity of Mary arises from the use of the word, prototokos, translated "first-born" in Luke's gospel. Luke 2: 7 (Mary) gave birth to her firstborn son (prototokos). She wrapped him in swaddling clothes and laid him in a manger. . . The Greek word prototokos is used of Christ as born of Mary and of Christ's relationship to His Father (Col 1: 25). As the word does not imply other children of God the Father, neither does it imply other children of Mary. The term "first-born" was a legal term under the Mosaic Law (Ex 6: 14) referring to the first male child born to Jewish parents regardless of any other children following or not. Hence when Jesus is called the "first-born" of Mary it does not mean that there were second or third-born children. 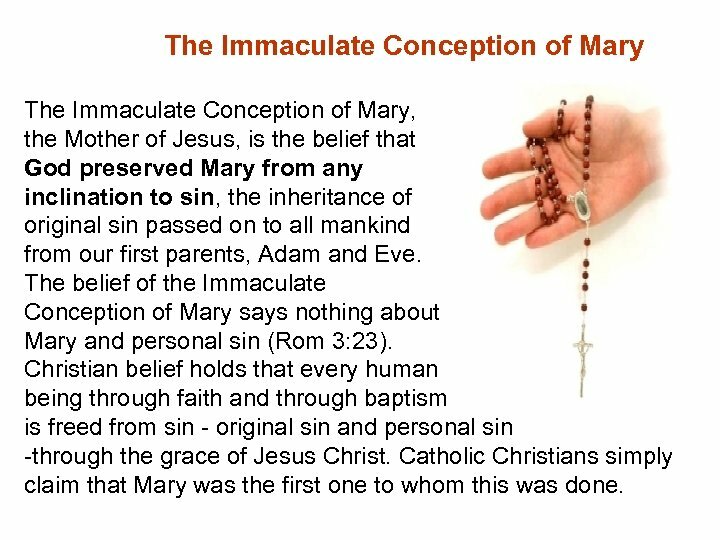 The Immaculate Conception of Mary, the Mother of Jesus, is the belief that God preserved Mary from any inclination to sin, the inheritance of original sin passed on to all mankind from our first parents, Adam and Eve. 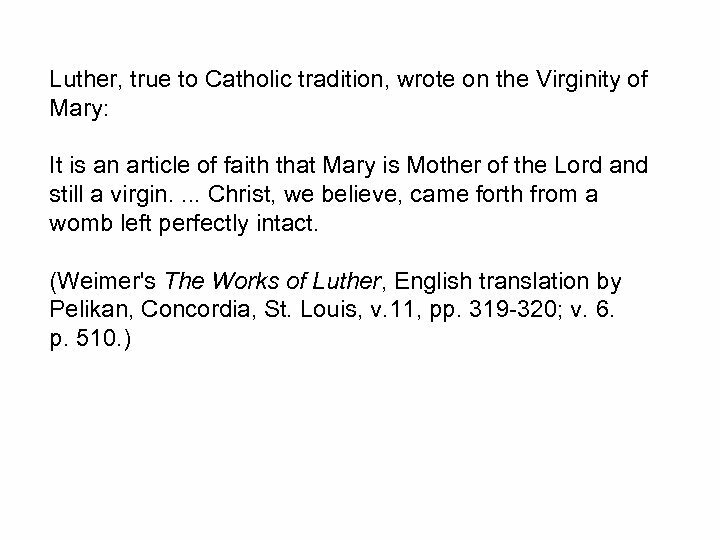 The belief of the Immaculate Conception of Mary says nothing about Mary and personal sin (Rom 3: 23). Christian belief holds that every human being through faith and through baptism is freed from sin - original sin and personal sin -through the grace of Jesus Christ. Catholic Christians simply claim that Mary was the first one to whom this was done. The basis for the belief in the Immaculate Conception of Mary can be found in the Biblical revelation of holiness and the opposite of that state, sinfulness. God is revealed as perfect interior holiness. Isaiah 6: 3 "Holy, holy is the Lord of hosts!" they (the Seraphim) cried one to the other. No sin or anything tainted with sin can stand in the face of the holiness of God. 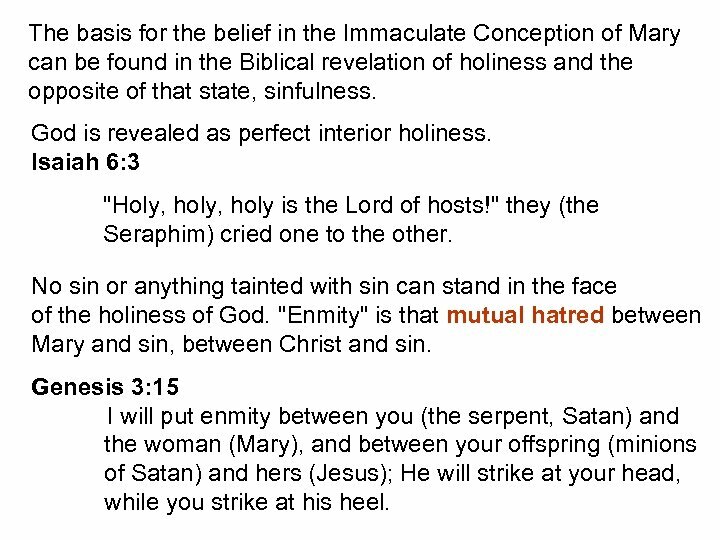 "Enmity" is that mutual hatred between Mary and sin, between Christ and sin. Genesis 3: 15 I will put enmity between you (the serpent, Satan) and the woman (Mary), and between your offspring (minions of Satan) and hers (Jesus); He will strike at your head, while you strike at his heel. 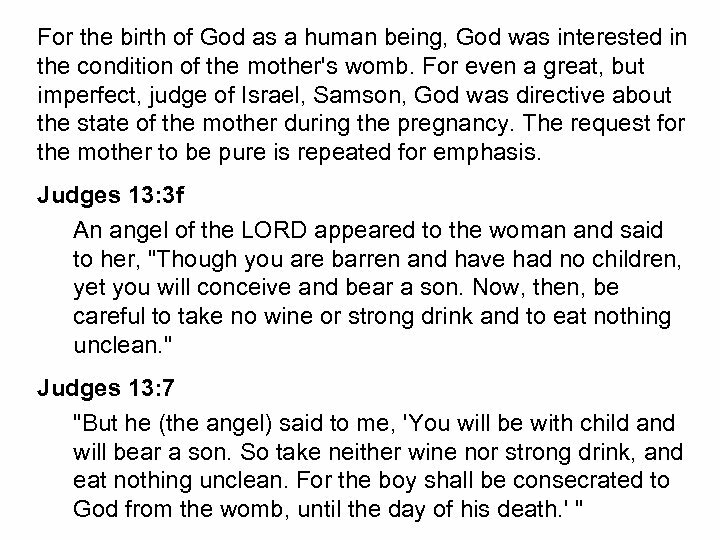 For the birth of God as a human being, God was interested in the condition of the mother's womb. For even a great, but imperfect, judge of Israel, Samson, God was directive about the state of the mother during the pregnancy. The request for the mother to be pure is repeated for emphasis. Judges 13: 3 f An angel of the LORD appeared to the woman and said to her, "Though you are barren and have had no children, yet you will conceive and bear a son. Now, then, be careful to take no wine or strong drink and to eat nothing unclean. " Judges 13: 7 "But he (the angel) said to me, 'You will be with child and will bear a son. So take neither wine nor strong drink, and eat nothing unclean. For the boy shall be consecrated to God from the womb, until the day of his death. ' "
Judges 13: 13 f The angel of the LORD answered Manoah, "Your wife is to abstain from all the things of which I spoke to her. She must not eat anything that comes from the vine, nor take wine or strong drink, nor eat anything unclean. Let her observe all that I have commanded her. " 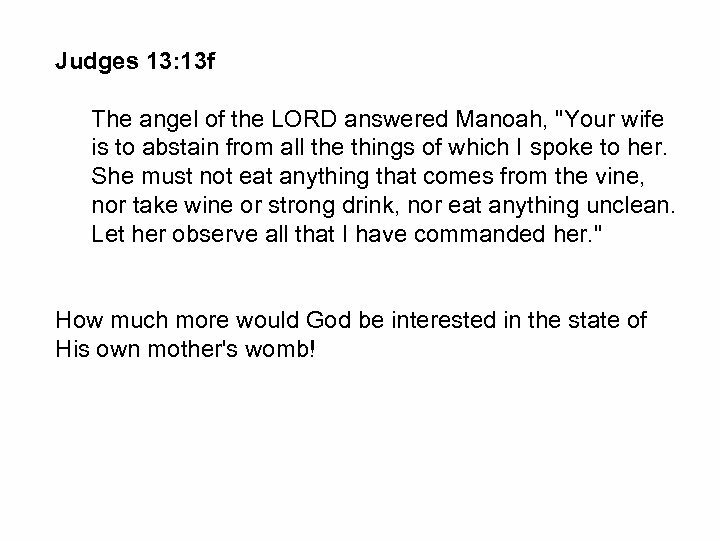 How much more would God be interested in the state of His own mother's womb! The salutation of the Angel Gabriel is different from the usual angelic greeting. 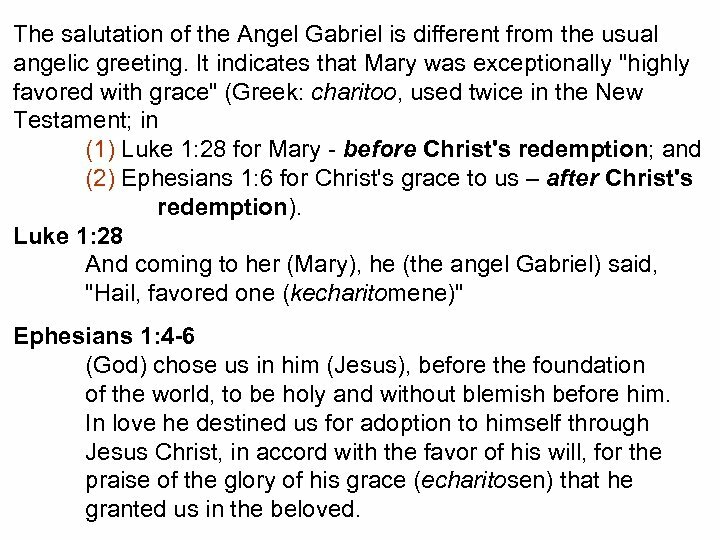 It indicates that Mary was exceptionally "highly favored with grace" (Greek: charitoo, used twice in the New Testament; in (1) Luke 1: 28 for Mary - before Christ's redemption; and (2) Ephesians 1: 6 for Christ's grace to us – after Christ's redemption). Luke 1: 28 And coming to her (Mary), he (the angel Gabriel) said, "Hail, favored one (kecharitomene)" Ephesians 1: 4 -6 (God) chose us in him (Jesus), before the foundation of the world, to be holy and without blemish before him. In love he destined us for adoption to himself through Jesus Christ, in accord with the favor of his will, for the praise of the glory of his grace (echaritosen) that he granted us in the beloved. 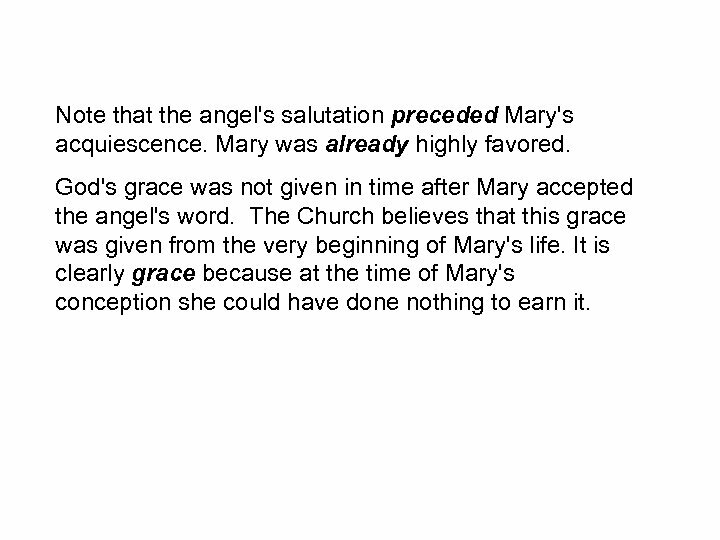 Note that the angel's salutation preceded Mary's acquiescence. Mary was already highly favored. God's grace was not given in time after Mary accepted the angel's word. The Church believes that this grace was given from the very beginning of Mary's life. It is clearly grace because at the time of Mary's conception she could have done nothing to earn it. 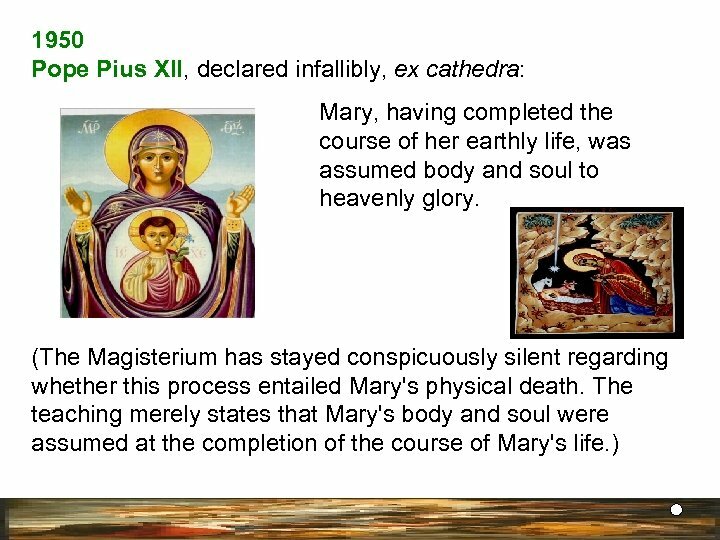 The constant faith (paradosis) of the Church attests to the belief in the special preparation of the holiness of the person of Mary to bear in her body the most holy person of the Son of God. Post-Apostolic Implicitly found in the Fathers of the Church in the parallelism between Eve and Mary (Irenaeus, Lyons, 140? - 202? 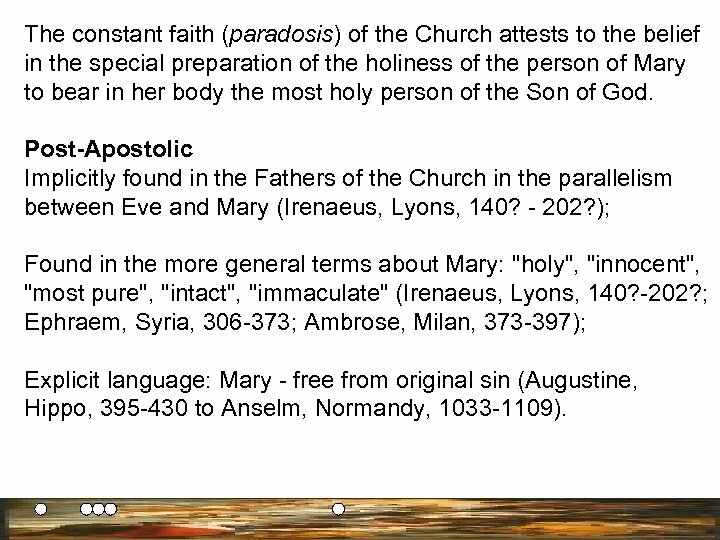 ); Found in the more general terms about Mary: "holy", "innocent", "most pure", "intact", "immaculate" (Irenaeus, Lyons, 140? -202? ; Ephraem, Syria, 306 -373; Ambrose, Milan, 373 -397); Explicit language: Mary - free from original sin (Augustine, Hippo, 395 -430 to Anselm, Normandy, 1033 -1109). Celebrations Eastern Church: celebrated a Feast of the Conception of Mary in the 8 th to the 9 th Century; Western Church: celebrated a Feast of the Conception of Mary in the 12 th Century; A record of the feast in the 11 th Century in Great Britain; in the 12 th Century in Normandy; Record in many churches of a Feast of the Conception of Mary in France, Germany, Italy and Spain in the 12 th Century (Bernard, Clairvaux, 1090 -1153). 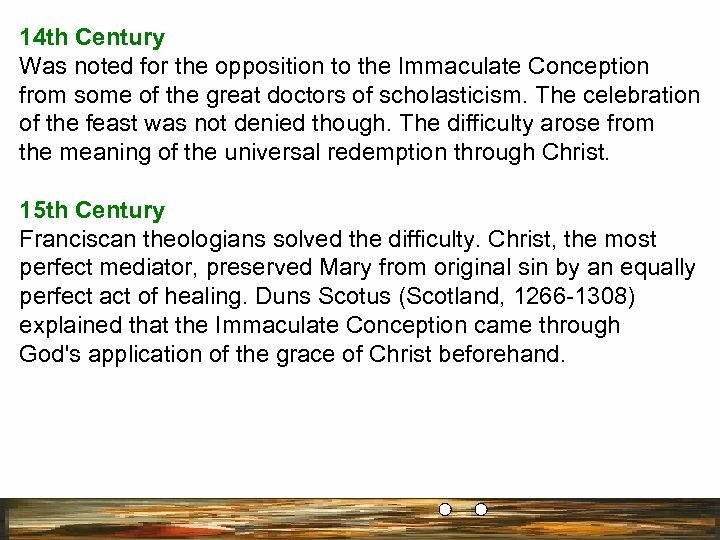 14 th Century Was noted for the opposition to the Immaculate Conception from some of the great doctors of scholasticism. The celebration of the feast was not denied though. The difficulty arose from the meaning of the universal redemption through Christ. 15 th Century Franciscan theologians solved the difficulty. 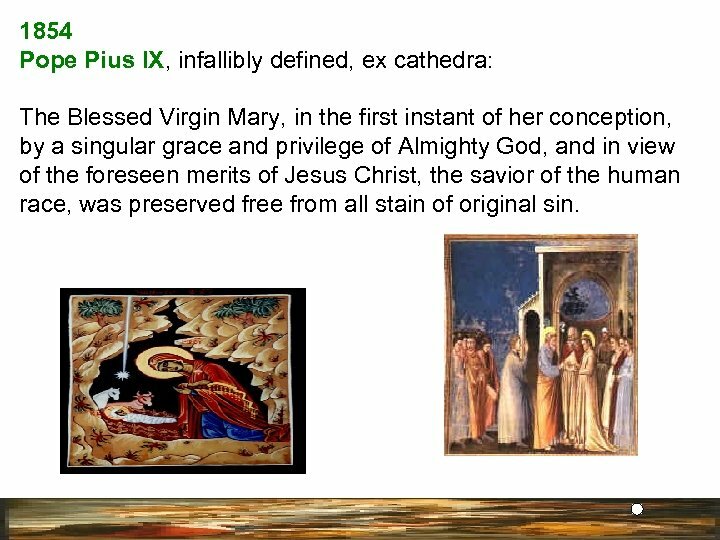 Christ, the most perfect mediator, preserved Mary from original sin by an equally perfect act of healing. Duns Scotus (Scotland, 1266 -1308) explained that the Immaculate Conception came through God's application of the grace of Christ beforehand. 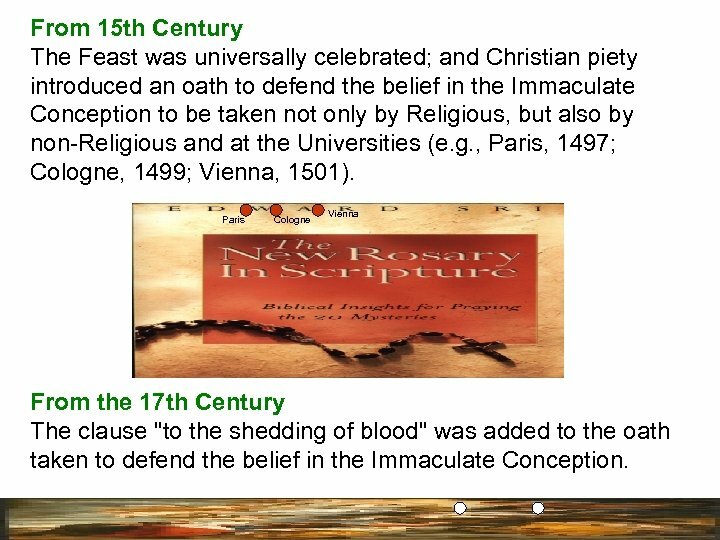 From 15 th Century The Feast was universally celebrated; and Christian piety introduced an oath to defend the belief in the Immaculate Conception to be taken not only by Religious, but also by non-Religious and at the Universities (e. g. , Paris, 1497; Cologne, 1499; Vienna, 1501). 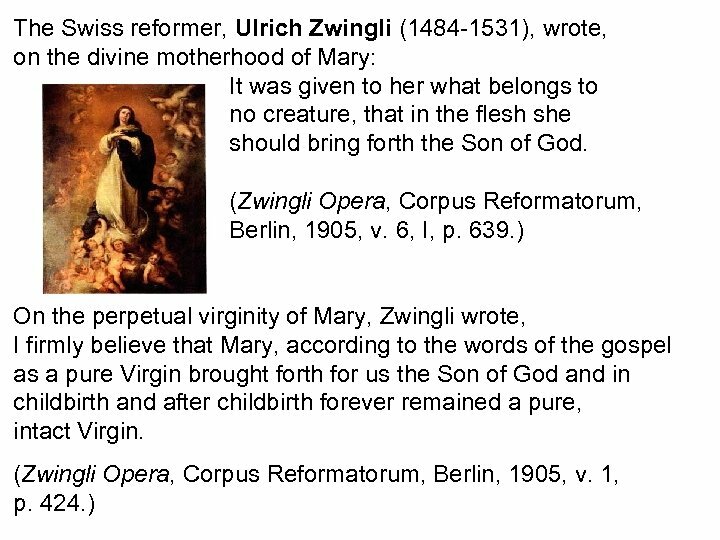 Paris Cologne Vienna From the 17 th Century The clause "to the shedding of blood" was added to the oath taken to defend the belief in the Immaculate Conception. 1854 Pope Pius IX, infallibly defined, ex cathedra: The Blessed Virgin Mary, in the first instant of her conception, by a singular grace and privilege of Almighty God, and in view of the foreseen merits of Jesus Christ, the savior of the human race, was preserved free from all stain of original sin. 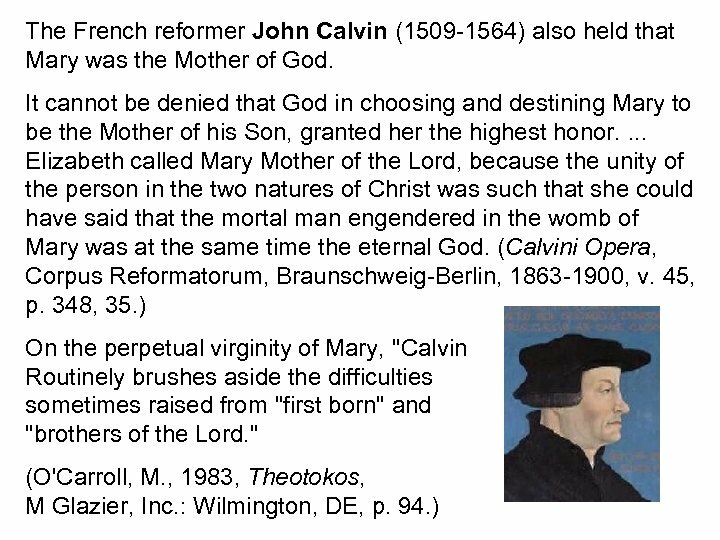 • Nonbelievers and enemies of Catholic Christianity often accuse the Church of creating the belief in Mary's freedom from original sin "the Immaculate Conception" in 1854 (as the Church named the belief of Mary's freedom from the wages of sin, death, "the Assumption" in 1950) when the truths were defined. Such an error is equivalent to saying that before Adam named the animals and birds of creation in Gen 2: 19 -20 they did not exist. 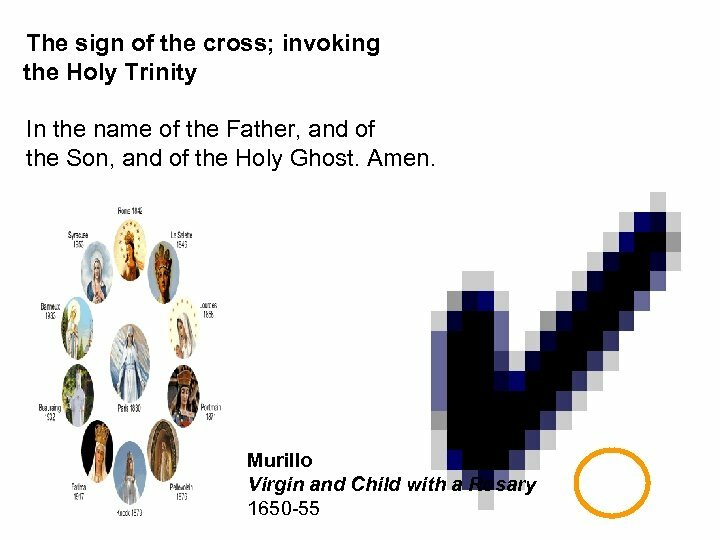 • Or that before the early Church in her Ecumenical Councils named the belief of three persons in one God "the Trinity" and the belief that there are two natures, human and divine in the person of Jesus Christ "the Incarnation, " the truths did not exist. In naming the content of Divine Revelation after God has revealed it to us, the Church reflects a long Biblical tradition and practice. 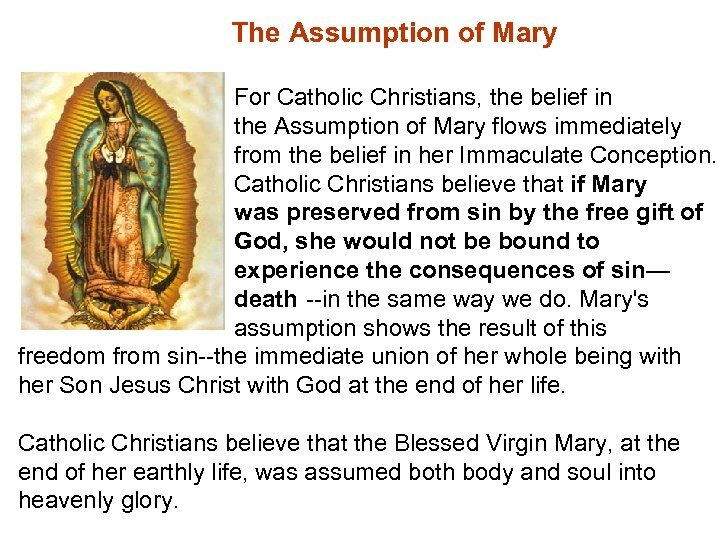 The Assumption of Mary For Catholic Christians, the belief in the Assumption of Mary flows immediately from the belief in her Immaculate Conception. Catholic Christians believe that if Mary was preserved from sin by the free gift of God, she would not be bound to experience the consequences of sin— death --in the same way we do. Mary's assumption shows the result of this freedom from sin--the immediate union of her whole being with her Son Jesus Christ with God at the end of her life. Catholic Christians believe that the Blessed Virgin Mary, at the end of her earthly life, was assumed both body and soul into heavenly glory. Romans 5: 12 Therefore, just as through one person sin entered the world, and through sin, death, and thus death came to all, inasmuch as all sinned. . . Romans 6: 23 For the wages of sin is death, but the gift of God is eternal life in Christ Jesus our Lord. 1 Corinthians 15: 21 -26 For since death came through a human being, the resurrection of the dead came also through a human being. 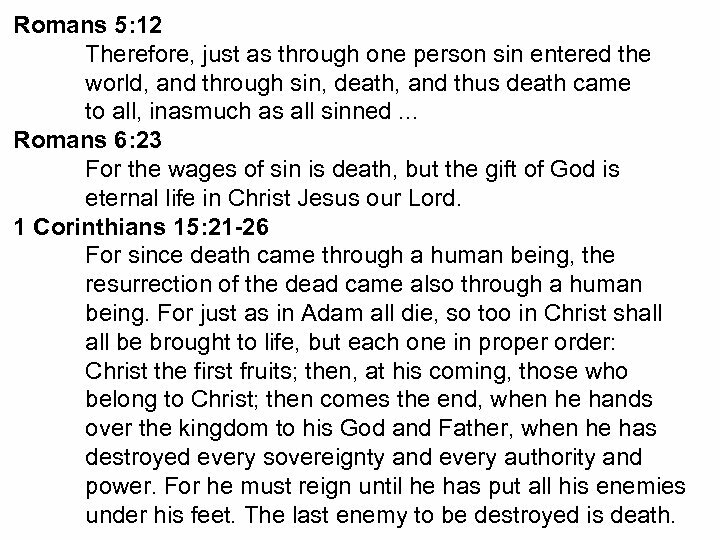 For just as in Adam all die, so too in Christ shall be brought to life, but each one in proper order: Christ the first fruits; then, at his coming, those who belong to Christ; then comes the end, when he hands over the kingdom to his God and Father, when he has destroyed every sovereignty and every authority and power. For he must reign until he has put all his enemies under his feet. The last enemy to be destroyed is death. 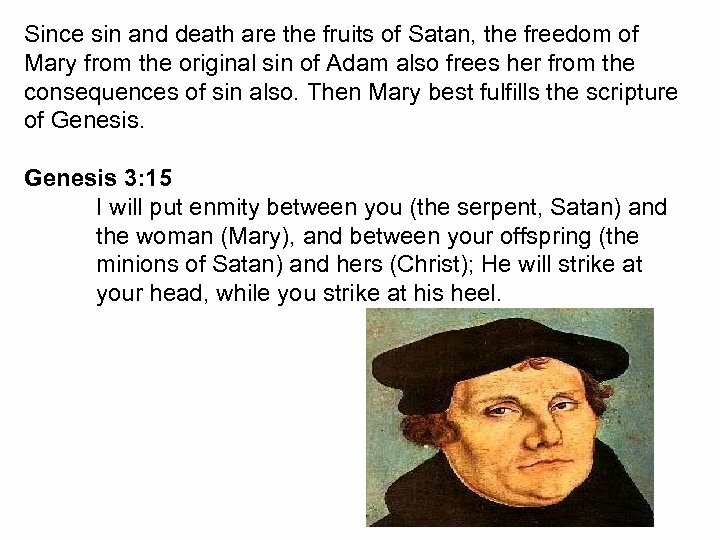 Since sin and death are the fruits of Satan, the freedom of Mary from the original sin of Adam also frees her from the consequences of sin also. 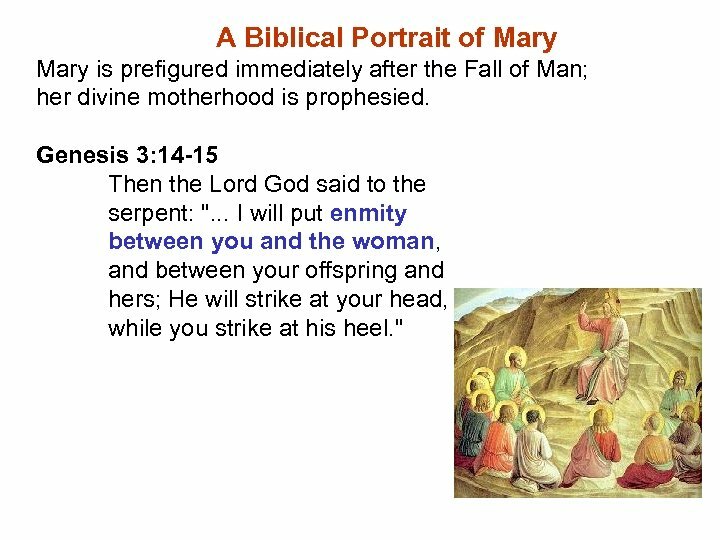 Then Mary best fulfills the scripture of Genesis 3: 15 I will put enmity between you (the serpent, Satan) and the woman (Mary), and between your offspring (the minions of Satan) and hers (Christ); He will strike at your head, while you strike at his heel. 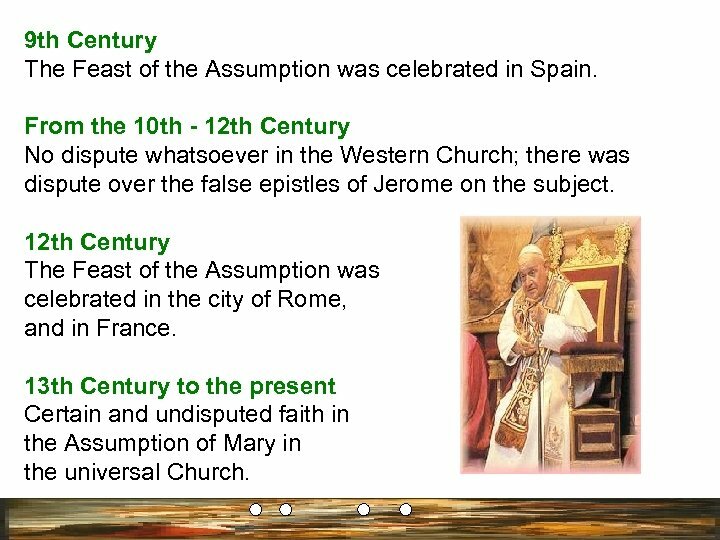 9 th Century The Feast of the Assumption was celebrated in Spain. From the 10 th - 12 th Century No dispute whatsoever in the Western Church; there was dispute over the false epistles of Jerome on the subject. 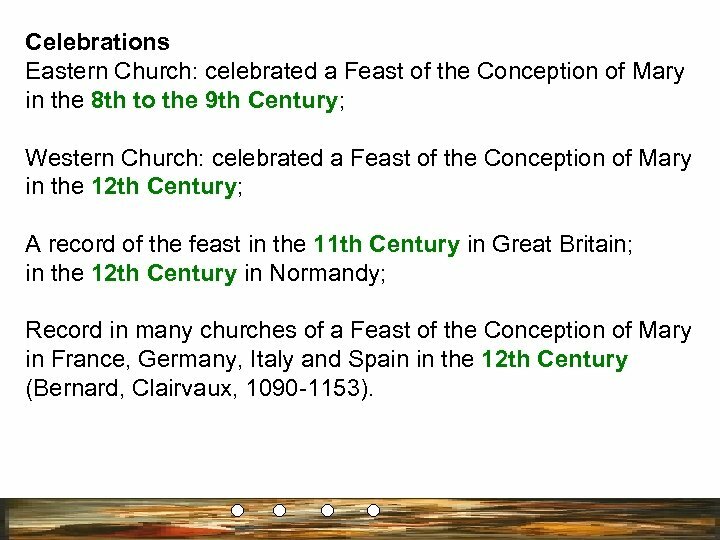 12 th Century The Feast of the Assumption was celebrated in the city of Rome, and in France. 13 th Century to the present Certain and undisputed faith in the Assumption of Mary in the universal Church. 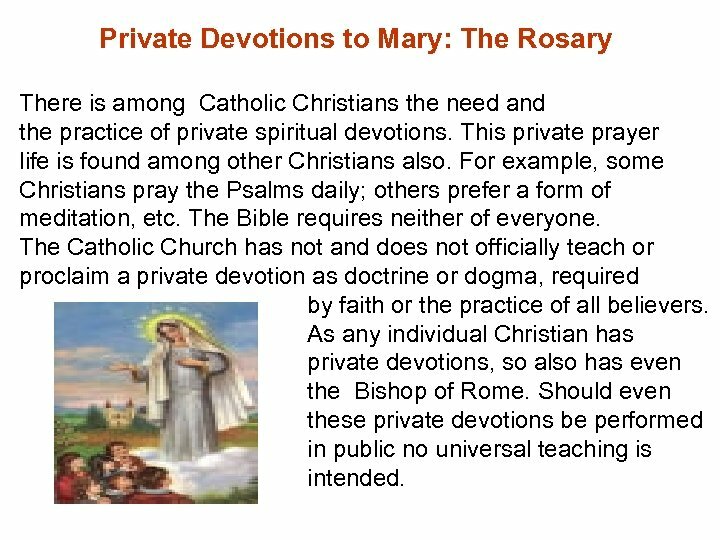 Private Devotions to Mary: The Rosary There is among Catholic Christians the need and the practice of private spiritual devotions. This private prayer life is found among other Christians also. For example, some Christians pray the Psalms daily; others prefer a form of meditation, etc. The Bible requires neither of everyone. 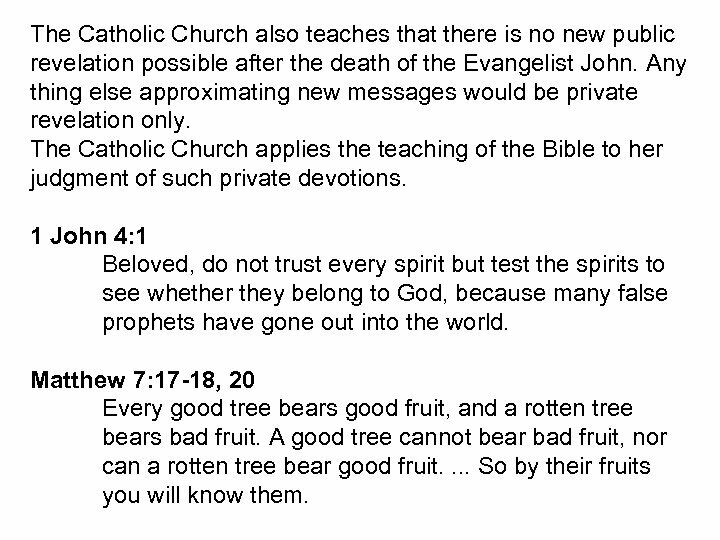 The Catholic Church has not and does not officially teach or proclaim a private devotion as doctrine or dogma, required by faith or the practice of all believers. As any individual Christian has private devotions, so also has even the Bishop of Rome. Should even these private devotions be performed in public no universal teaching is intended. 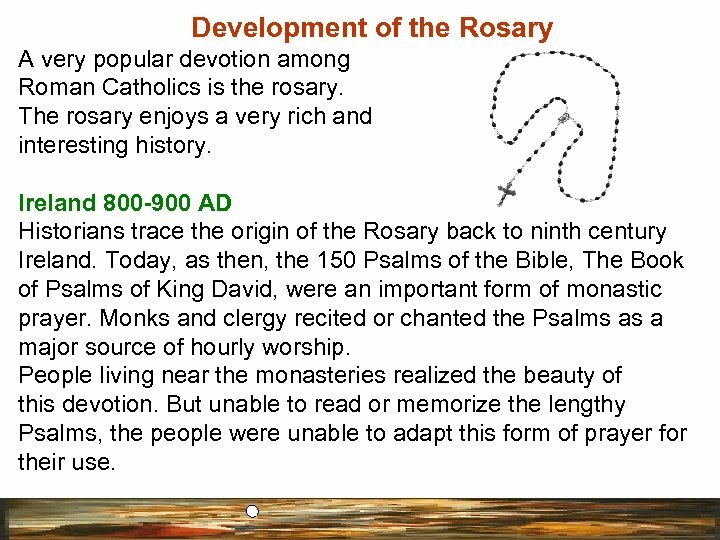 Development of the Rosary A very popular devotion among Roman Catholics is the rosary. 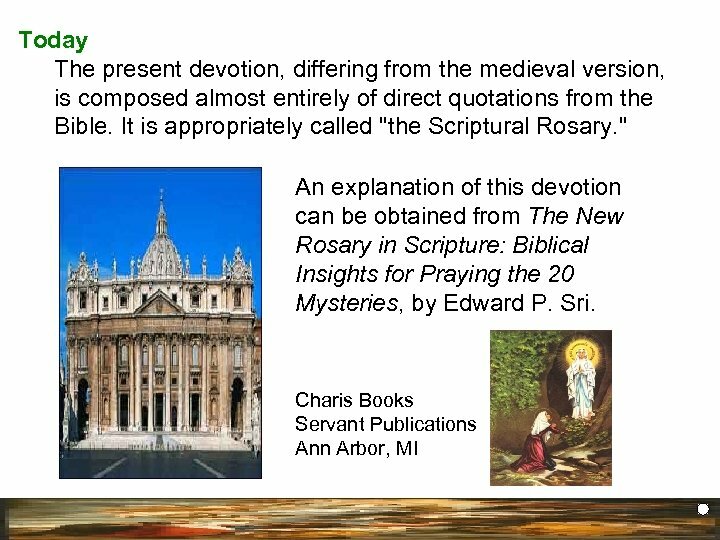 The rosary enjoys a very rich and interesting history. Ireland 800 -900 AD Historians trace the origin of the Rosary back to ninth century Ireland. Today, as then, the 150 Psalms of the Bible, The Book of Psalms of King David, were an important form of monastic prayer. Monks and clergy recited or chanted the Psalms as a major source of hourly worship. People living near the monasteries realized the beauty of this devotion. But unable to read or memorize the lengthy Psalms, the people were unable to adapt this form of prayer for their use. First stage An Irish monk suggested to the people around the monastery that they might pray a series of 150 Our Fathers in place of the 150 Psalms. 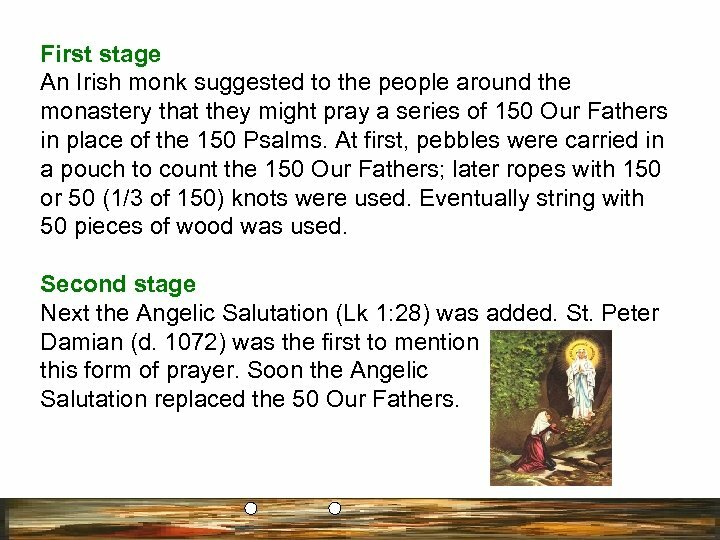 At first, pebbles were carried in a pouch to count the 150 Our Fathers; later ropes with 150 or 50 (1/3 of 150) knots were used. Eventually string with 50 pieces of wood was used. Second stage Next the Angelic Salutation (Lk 1: 28) was added. St. Peter Damian (d. 1072) was the first to mention this form of prayer. Soon the Angelic Salutation replaced the 50 Our Fathers. Third stage Some medieval theologians considered the 150 Psalms to be veiled mysteries about the life, death and resurrection of Jesus. They began to compose "Psalters of Our Lord and Savior Jesus Christ" - 150 praises in honor of Jesus. 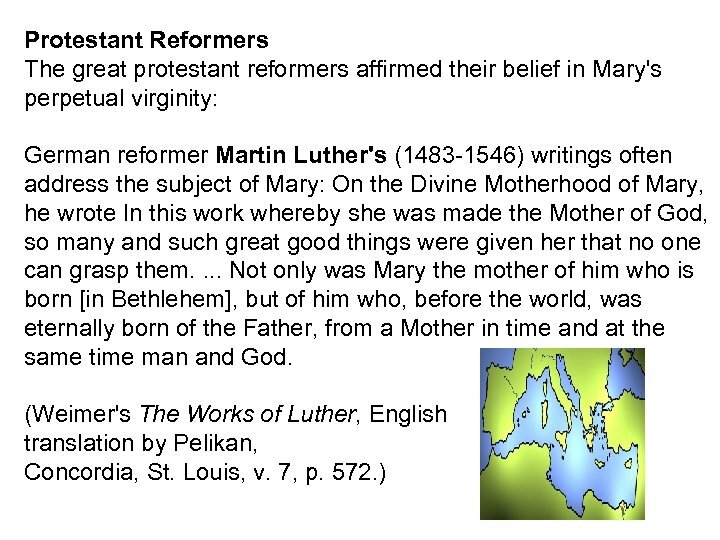 Soon psalters devoted to 150 praises of Mary were composed. 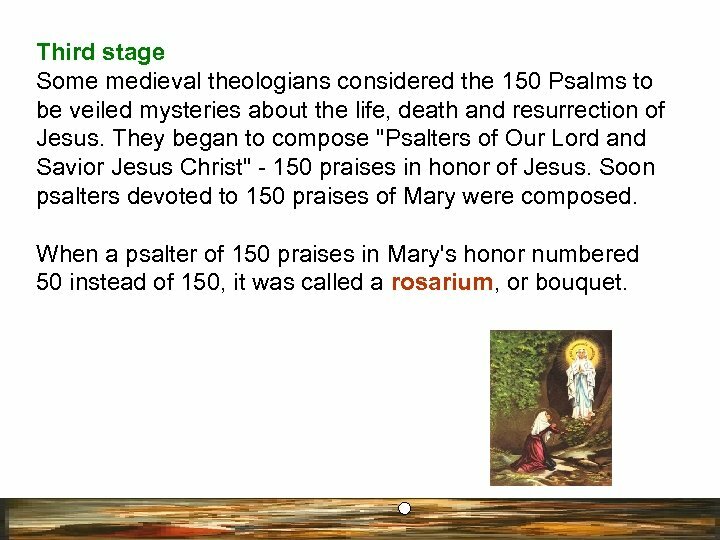 When a psalter of 150 praises in Mary's honor numbered 50 instead of 150, it was called a rosarium, or bouquet. c. 1365 The salutations were grouped into decades and an Our Father was put before each decade. This combined the Our Father and the Angelic Salutation for the first time. 1409 AD Special thoughts - meditations - were attached for each Hail Mary bead. 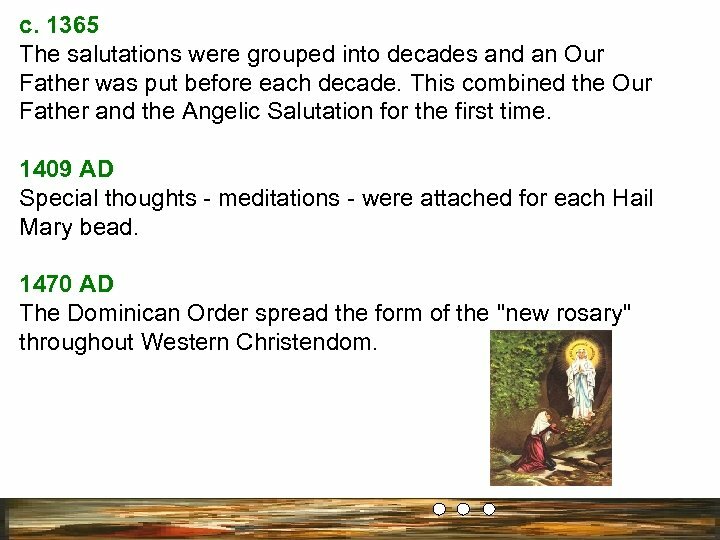 1470 AD The Dominican Order spread the form of the "new rosary" throughout Western Christendom. 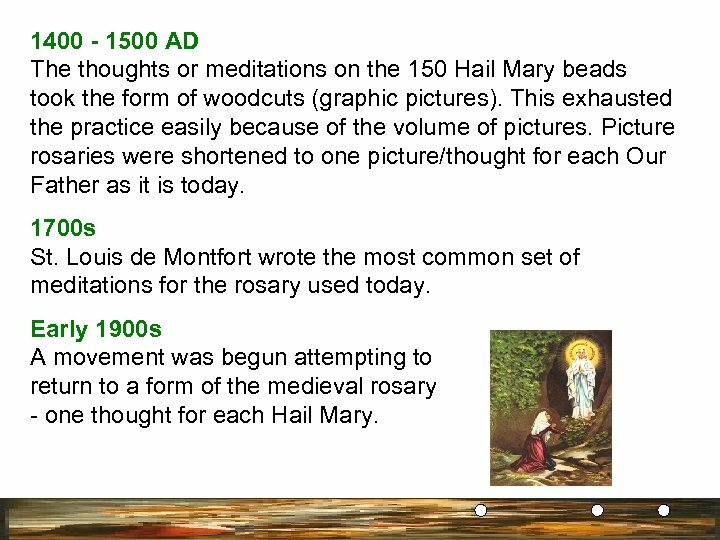 1400 - 1500 AD The thoughts or meditations on the 150 Hail Mary beads took the form of woodcuts (graphic pictures). This exhausted the practice easily because of the volume of pictures. 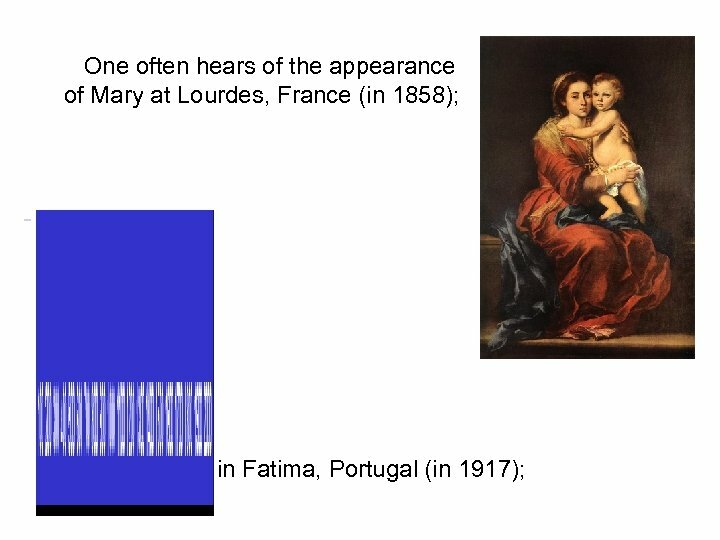 Picture rosaries were shortened to one picture/thought for each Our Father as it is today. 1700 s St. Louis de Montfort wrote the most common set of meditations for the rosary used today. Early 1900 s A movement was begun attempting to return to a form of the medieval rosary - one thought for each Hail Mary. 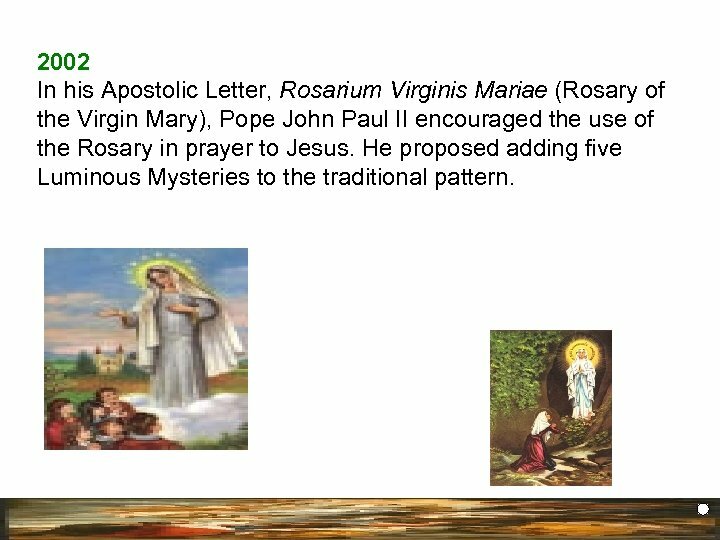 2002 In his Apostolic Letter, Rosarium Virginis Mariae (Rosary of the Virgin Mary), Pope John Paul II encouraged the use of the Rosary in prayer to Jesus. He proposed adding five Luminous Mysteries to the traditional pattern. 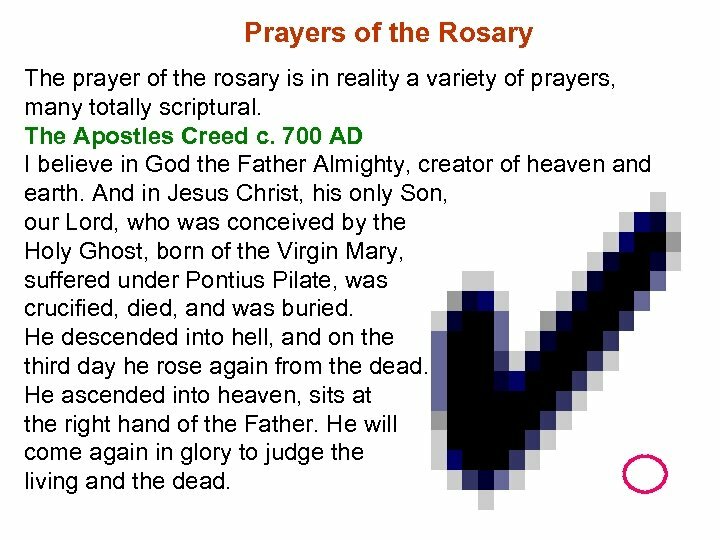 Prayers of the Rosary The prayer of the rosary is in reality a variety of prayers, many totally scriptural. The Apostles Creed c. 700 AD I believe in God the Father Almighty, creator of heaven and earth. And in Jesus Christ, his only Son, our Lord, who was conceived by the Holy Ghost, born of the Virgin Mary, suffered under Pontius Pilate, was crucified, died, and was buried. He descended into hell, and on the third day he rose again from the dead. He ascended into heaven, sits at the right hand of the Father. He will come again in glory to judge the living and the dead. I believe in the Holy Spirit, the holy catholic church, the communion of saints, the forgiveness of sins, the resurrection of the body and life everlasting. Amen Matthew 6: 9 -13 Our Father in heaven, hallowed be your name, your kingdom come, your will be done, on earth as in heaven. Give us today our daily bread; and forgive us our debts, as we forgive our debtors; and do not subject us to the final test, but deliver us from the evil one. 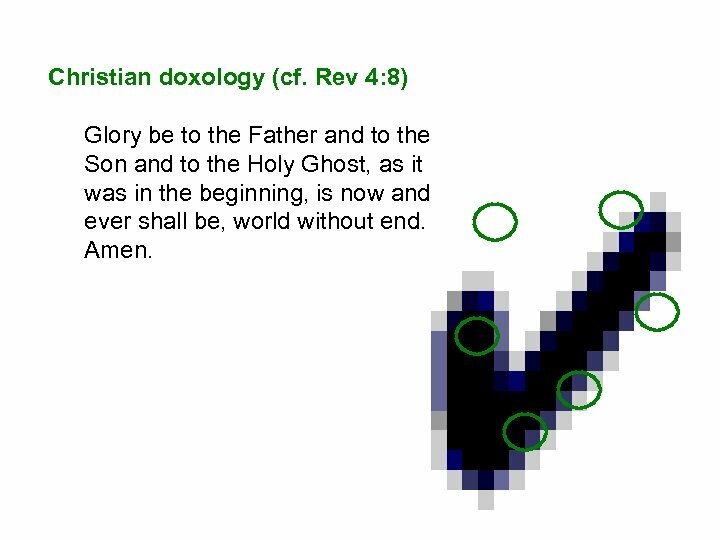 Christian doxology (cf. Rev 4: 8) Glory be to the Father and to the Son and to the Holy Ghost, as it was in the beginning, is now and ever shall be, world without end. Amen. It is difficult to see how some Christians can criticize the private prayer life of other Christians. One such criticism centers on the element of repetition of the prayer, "Hail Mary. " But to even the casual reader of the word of God it must be apparent that the writers of the Bible--and God Himself--used the repetition of words and expressions in prayer. The Bible uses repetition to indicate emphasis and the highest degree of something. Isaiah 6: 3 "Holy, holy is the Lord of Hosts!" they (the Seraphim) cried one to another. The Psalms are a good example of repetition in prayer. 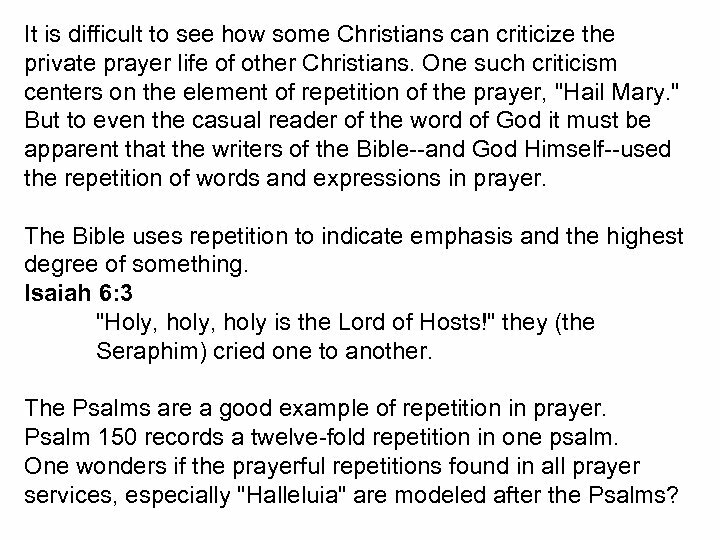 Psalm 150 records a twelve-fold repetition in one psalm. One wonders if the prayerful repetitions found in all prayer services, especially "Halleluia" are modeled after the Psalms? 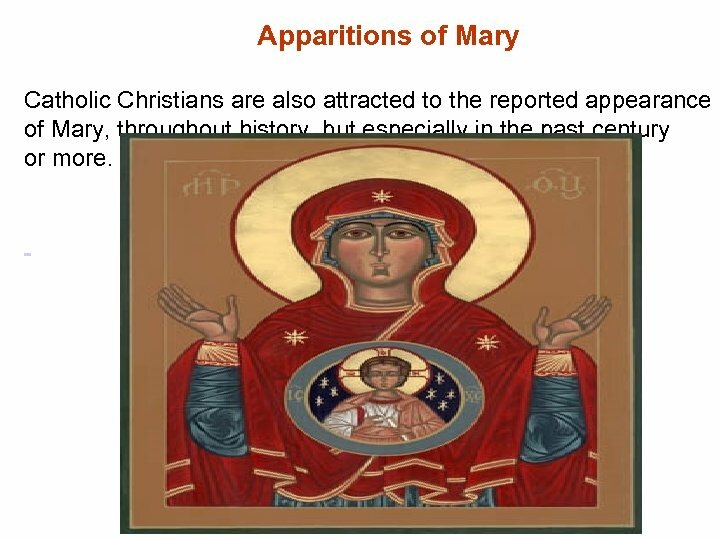 Apparitions of Mary Catholic Christians are also attracted to the reported appearance of Mary, throughout history, but especially in the past century or more. 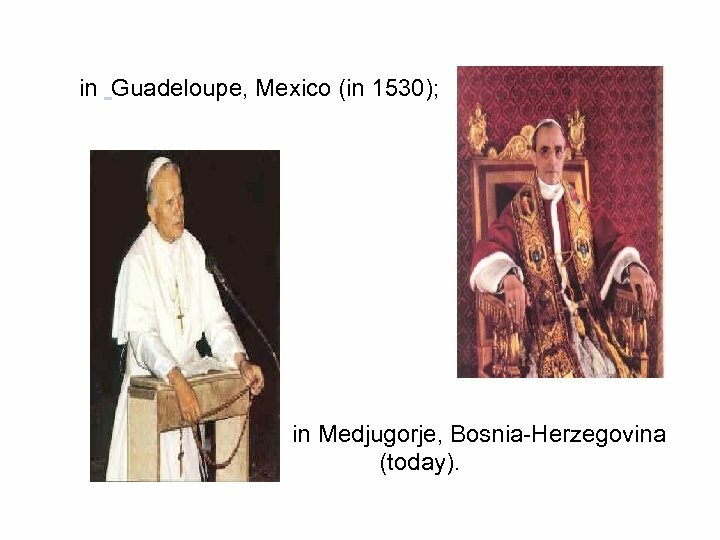 in Guadeloupe, Mexico (in 1530); in Medjugorje, Bosnia-Herzegovina (today). It must first be recalled that the Catholic Church does not teach that these visits of Mary are a matter of either faith or morals for Catholics. These fall in the class of private devotion. 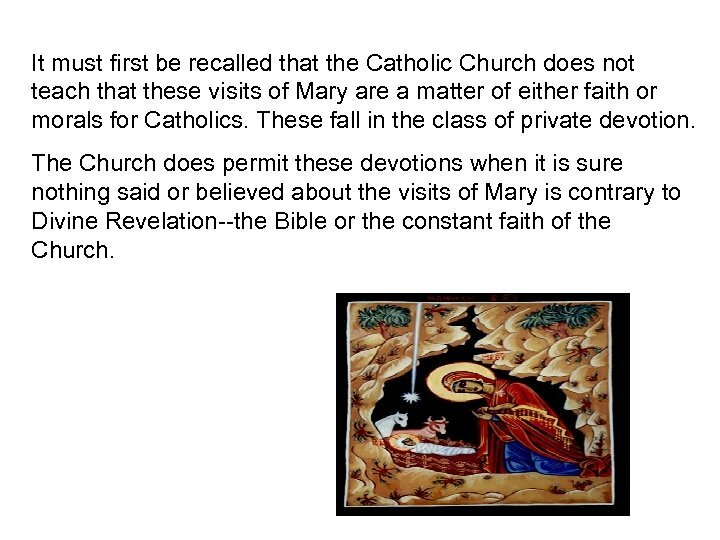 The Church does permit these devotions when it is sure nothing said or believed about the visits of Mary is contrary to Divine Revelation--the Bible or the constant faith of the Church. The Catholic Church also teaches that there is no new public revelation possible after the death of the Evangelist John. Any thing else approximating new messages would be private revelation only. The Catholic Church applies the teaching of the Bible to her judgment of such private devotions. 1 John 4: 1 Beloved, do not trust every spirit but test the spirits to see whether they belong to God, because many false prophets have gone out into the world. Matthew 7: 17 -18, 20 Every good tree bears good fruit, and a rotten tree bears bad fruit. A good tree cannot bear bad fruit, nor can a rotten tree bear good fruit. . So by their fruits you will know them. James 3: 12 Can a fig tree, my brothers, produce olives, or a grapevine figs? Neither can salt water yield fresh. The tests of such apparitions of Mary have shown that nothing in her messages and consequent devotion contradicts the word of God and the constant teaching of the Church. 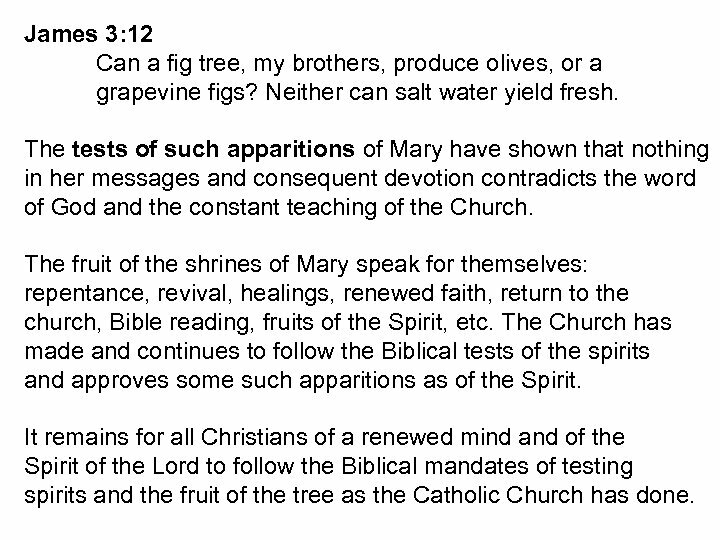 The fruit of the shrines of Mary speak for themselves: repentance, revival, healings, renewed faith, return to the church, Bible reading, fruits of the Spirit, etc. The Church has made and continues to follow the Biblical tests of the spirits and approves some such apparitions as of the Spirit. It remains for all Christians of a renewed mind and of the Spirit of the Lord to follow the Biblical mandates of testing spirits and the fruit of the tree as the Catholic Church has done. • Questions or comments? 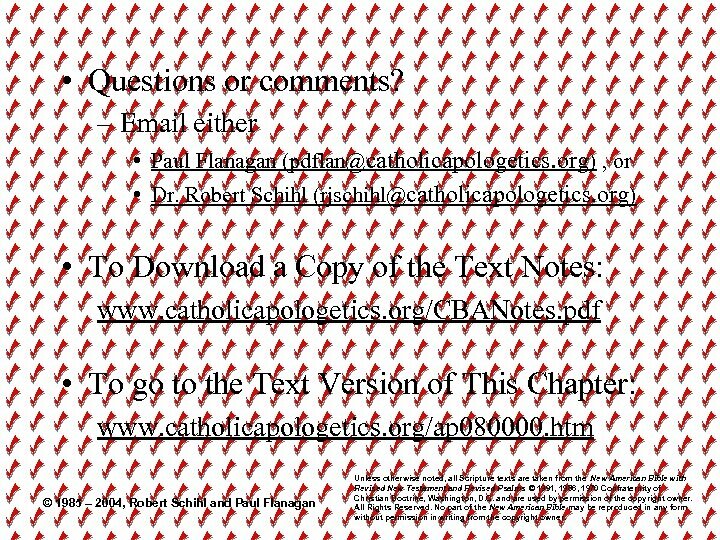 – Email either • Paul Flanagan ([email protected] org) , or • Dr. Robert Schihl ([email protected] org) • To Download a Copy of the Text Notes: www. catholicapologetics. org/CBANotes. pdf • To go to the Text Version of This Chapter: www. catholicapologetics. org/ap 080000. htm © 1985 – 2004, Robert Schihl and Paul Flanagan Unless otherwise noted, all Scripture texts are taken from the New American Bible with Revised New Testament and Revised Psalms © 1991, 1986, 1970 Confraternity of Christian Doctrine, Washington, D. C. and are used by permission of the copyright owner. All Rights Reserved. No part of the New American Bible may be reproduced in any form without permission in writing from the copyright owner.